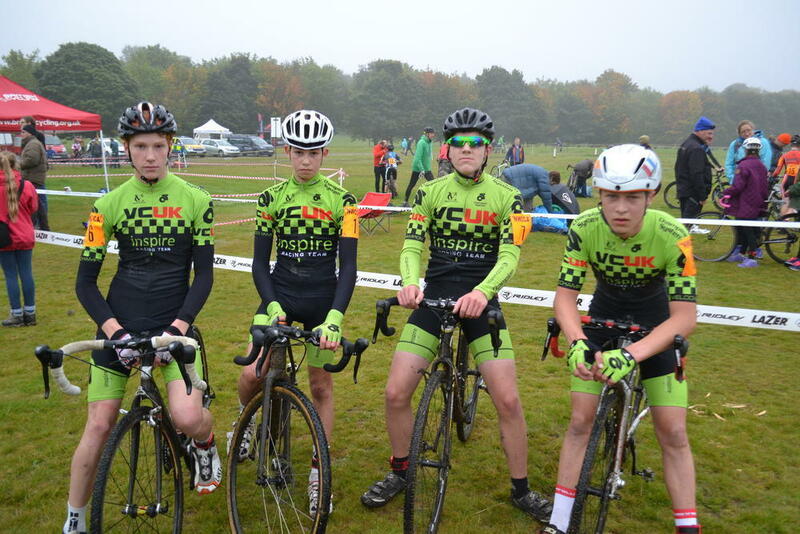 The BGF have given support to the Inspire VCUK Youth Racing Team based across the North West of England. The Youth A boys was the final event of the day and the weather cleared for the gruelling 90 minutes in hot conditions, cheered eagerly on by a very large group of spectators. As expected the early pace was hard from the gun with a series of attacks and counter attacks. The most significant starting as a bunch of four and soon swelling to six, looked like it might hold as it contained one of the hot favourites, Lewis Askey. These six riders worked well until a number of riders tried to escape the main peloton acting as a bridge and the break was brought back, due in no small part to a solid presence from the Isle of Man riders packing the front end of the peloton. Nothing then stuck until 35 minutes remained when Sean Flynn of Edinburgh RC struck out on his own. With several climbs of the infamous Hoggenberg left in the race and a strengthening headwind, it seemed unlikely that Flynn could solo to victory but he was soon to be joined by Joshua Sandman and the two together instantly looked much more cohesive and likely to succeed. They quickly opened what turned out to be a winning margin and though the peloton gradually clawed the break back the chase always looked fractious rather than controlled with several riders sitting in no-man’s land between break and peloton. In the main bunch Askey & Tulett were doing large amounts of work in trying to close down reducing the gap before the two escapees finally managed to get over the climb for the final time, Flynn getting away on the final few metres of the hill to take the prestigious win. 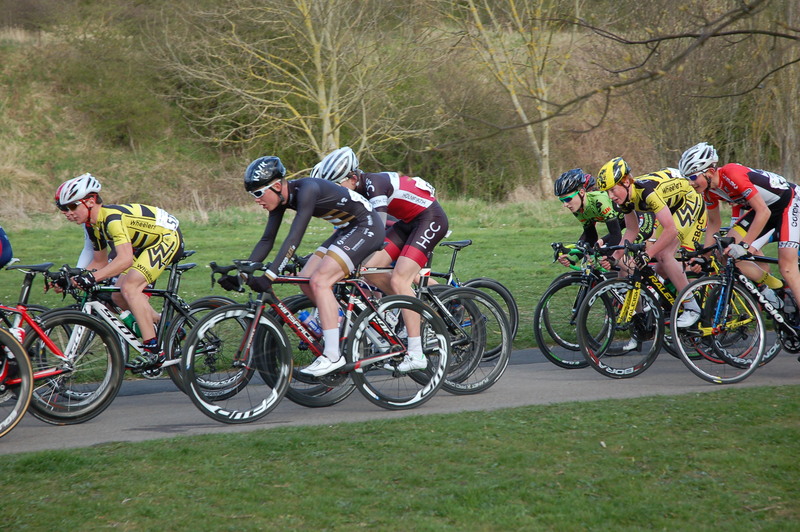 Throughout the race both Lewis and Dan were confidently positioned near the front of the peloton and both had attempts at getting away in breaks at various times. They felt fortunate not to be involved in any of the late crashes, especially when considering the large field size of 120 riders. 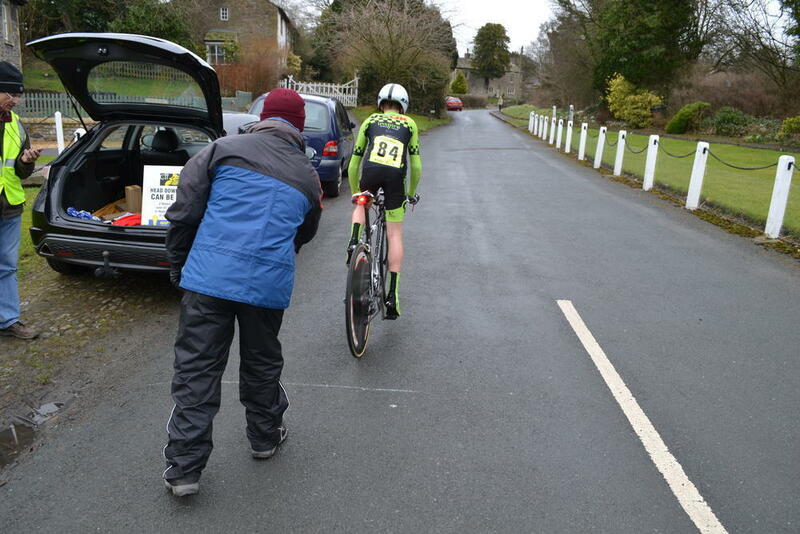 On the final effort up the hill and over the finish line Lewis rolled over in 21st place and Daniel in 29th. Both inside the top quarter of the field so very well done to both. 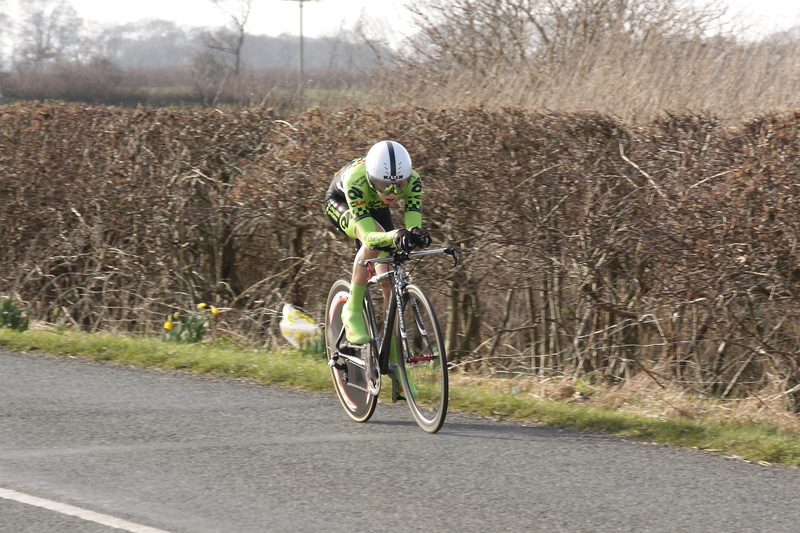 This week we had Daniel Gibson riding in the Phoenix CC Club 10mile TT at Rainford. Guess who set off 1 minute behind Daniel? Well good old Sir Bradley Wiggins rocked up, unannounced, and rode the local event. It took Bradley around 5miles to catch Daniel and at the finish, Wiggins recorded 19:15 whilst Daniel posted a PB of 21:33 to finish 5th overall. 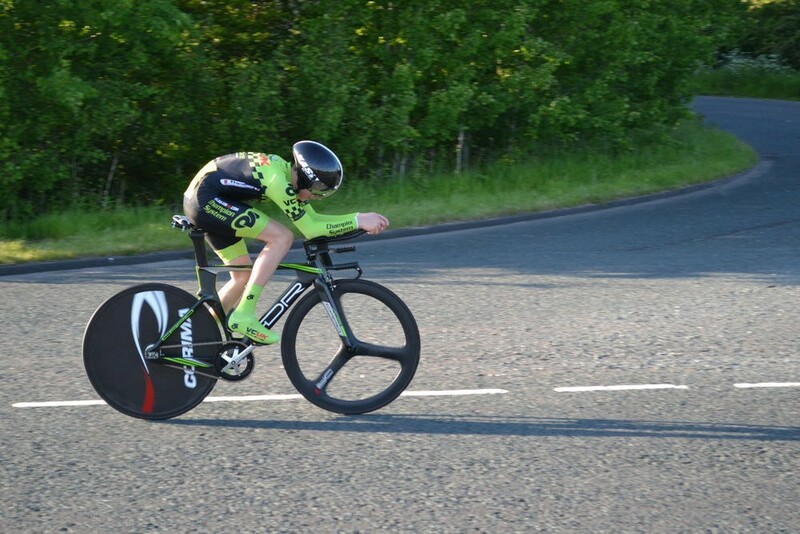 Lewis Hartley rode in the local Preston Evening Time Trial to record a PB (for this course) and a blistering time of 21:11. 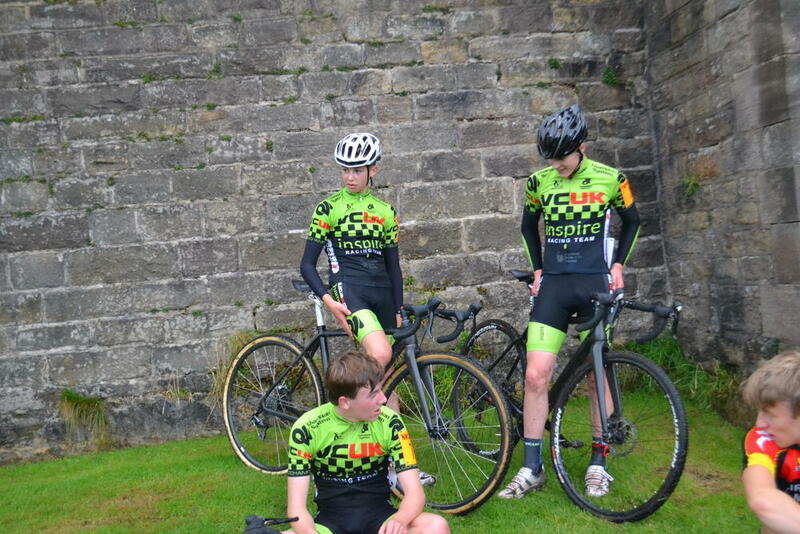 Cory Edmondson, Nathan Hawthorn and Lewis all rode the Clitheroe Future Stars Town Centre Criterium last Friday. 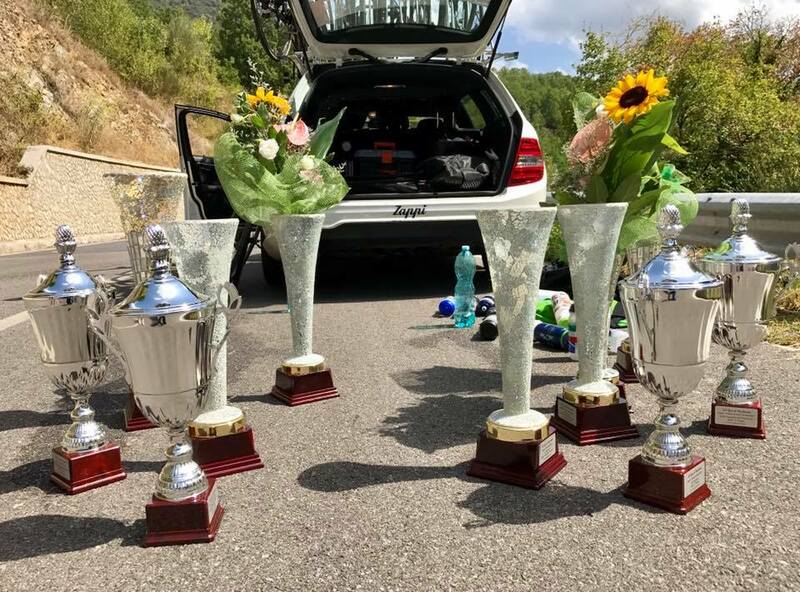 The race offered a tough ½ hr of riding involving a climb towards the castle and a fast technical descent with quite a few potholes on the circuit. The lads all rode very well at the front of affairs throughout with Nathan, Cory and Lewis all finishing in the top 10 and just off the podium. 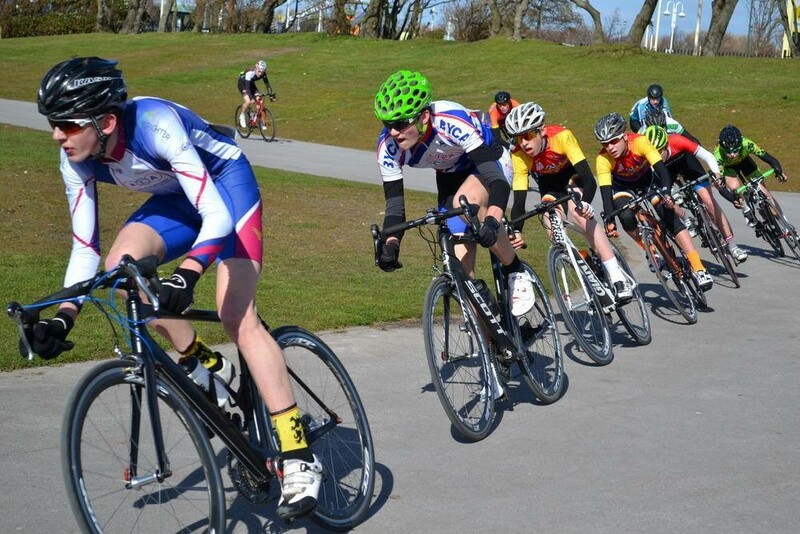 Last weekend the Inspire VCUK Racing Team travelled to Southport to compete in the North West Regional Circuit Race Championships.The race was 45 laps around Victoria Park, the longest race at Southport for some time.A cold morning greeted the riders for an early afternoon race with 34 riders taking to the grid.The team rode exceptionally well and showed themselves throughout. It was clear that our team was really the only team willing to take the race on. All the lads put down individual efforts to try and split the race and get riders up the road, only for the race to be neutralised by several other riders wanting to wait for a bunch finish. 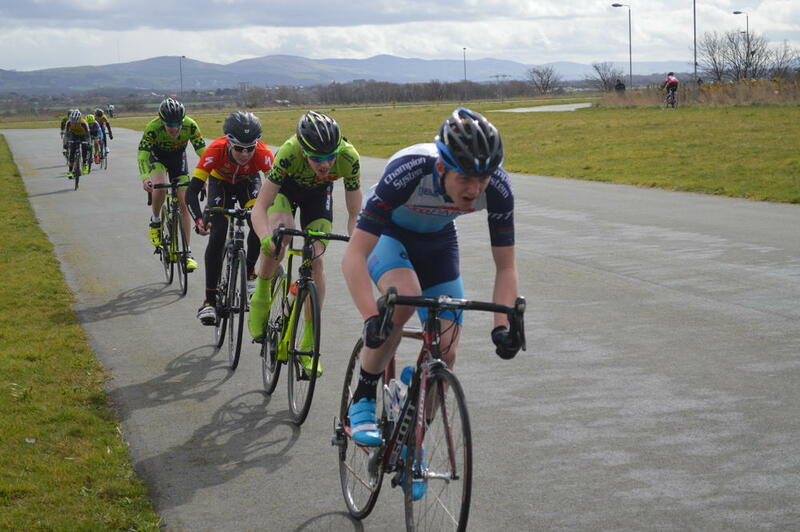 Daniel, Nathan and Lewis all rode solo efforts for several laps only to be reeled in by the IOM grupetto. 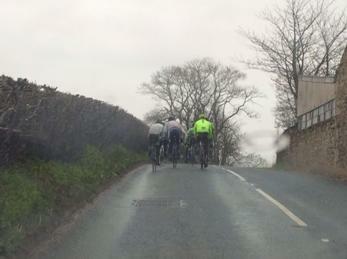 It was good to see team mates trying to control the bunch whilst VCUK riders were up the road. 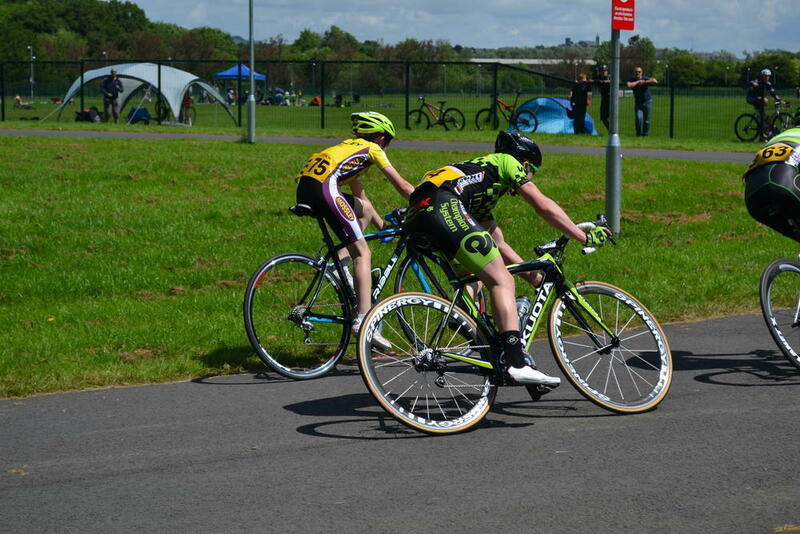 In the final corner of the last lap Nathan was forced onto the grass and had to settle for 15th place after a strong ride throughout. Lewis was disappointed only to take 6th having been sandwiched between riders in the sprint. Cory and Dan rolled home in 9th and 12th respectively. For full report please click link below. 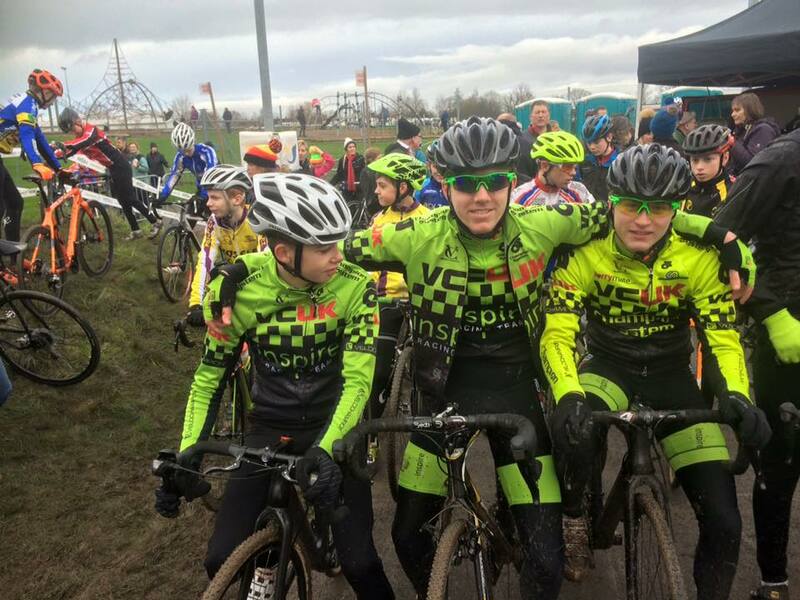 Sunday 17th April – two of the team travelled to Hetton-Le-Hole in the North East of England for the first National Series Youth Race. The team is supporting the new race series that commenced on March 31st in memory of Lewis Balyckyi. The series is named in memory of Lewis who was tragically killed in a road traffic accident in 2011. Since then The Lewis Balyckyi Trust charity has been established by Kevin and Jacqui Balyckyi. There are 18 rounds and the series will finish at the end of July. 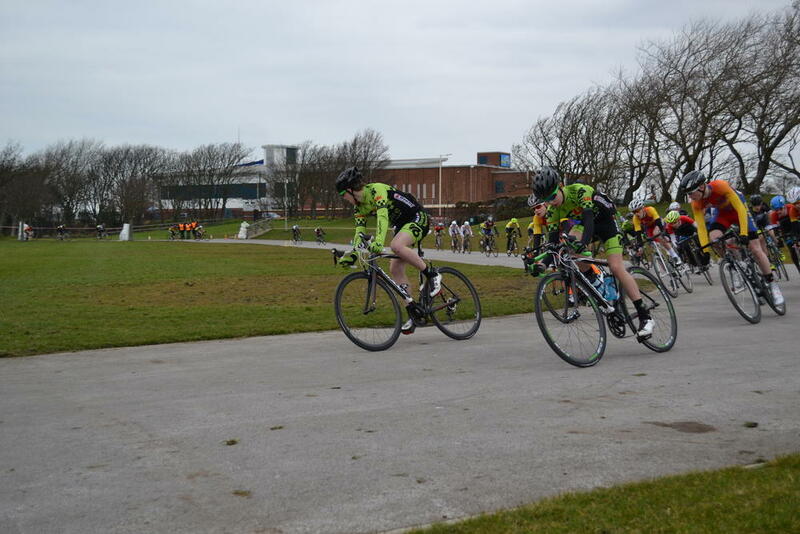 Round 10 of the NWCCA league was at the infamous Geoff Bewley Memorial CX hosted by Liverpool Century RC at Otterspool park, Liverpool a great setting on the banks of the river Mersey. 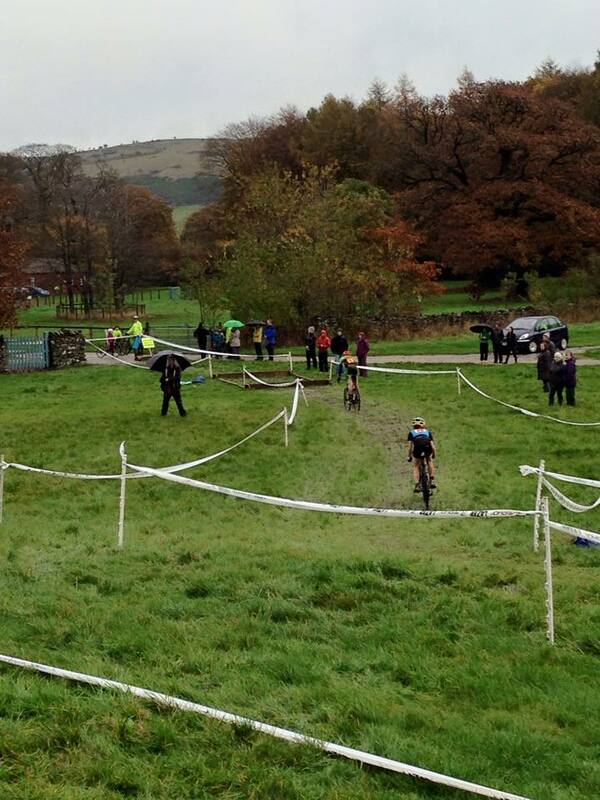 The day started off with a mist in the air and small showers which left the course very boggy in some places. The whistle blew at 10:45 am with around 40 riders frantically clipping in and racing uphill towards the pits to enter the course for the remaining laps. 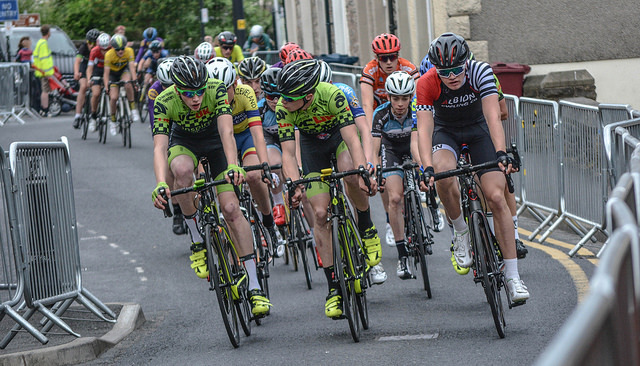 A group of early leaders formed containing two Inspire VCUK riders: Lewis Hartley and Cory Edmondson, alongside Sol Kerfoot-Robson and Isaac Peatfield. Part way through the opening lap, as the riders entered the upper part of the course, Lewis lost his back wheel on a particularly slippery corner and then Isaac crashed over Lewis with Cory also struggling to get past. This enabled Sol to escape and forge a good lead on the rest who were in hot pursuit. Lewis soon got back into the race with Cory and Isaac on his tail and by the time the riders had reached the pits on the 2nd lap, Lewis had caught Sol and overtaken the leader who subsequently retired from the race. This left Isaac and Cory battling out the remaining laps for 2nd and 3rd places, with Nathan Hawthorn and Daniel Gibson not too far behind either. 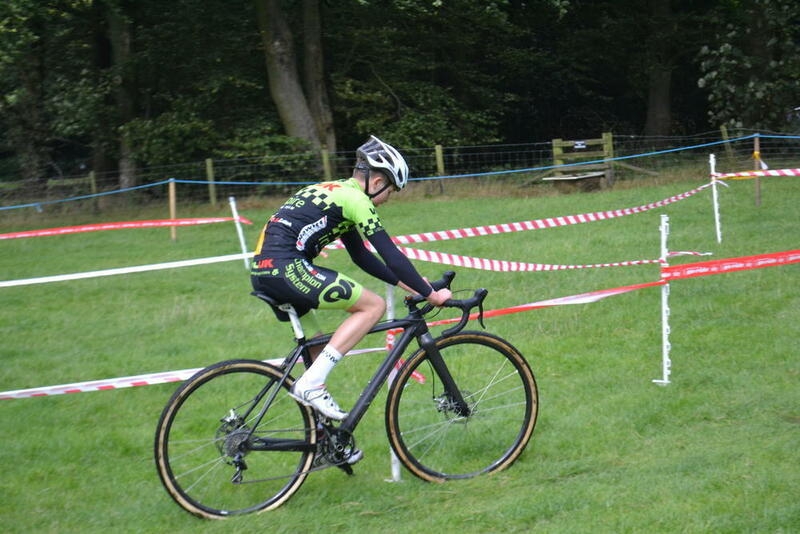 Unfortunately, Tom Ashcroft, our fifth rider in this race had a very early mechanical which caused his rear derailleur to separate from the frame and his race was over almost as soon as it started! In the end, Lewis took a convincing victory, with Isaac just taking 2nd place from Cory who finished 3rd to round off the podium. Nathan finishing 35 seconds down on the leader in 4th and Dan Gibson, who had earlier crashed, finished 38 seconds down in 8th. 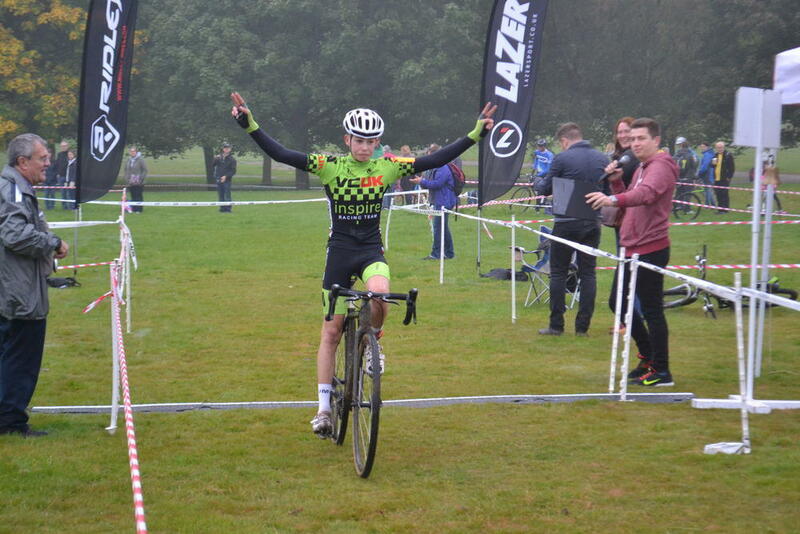 Another good day out for the Inspire VCUK Racing Team! 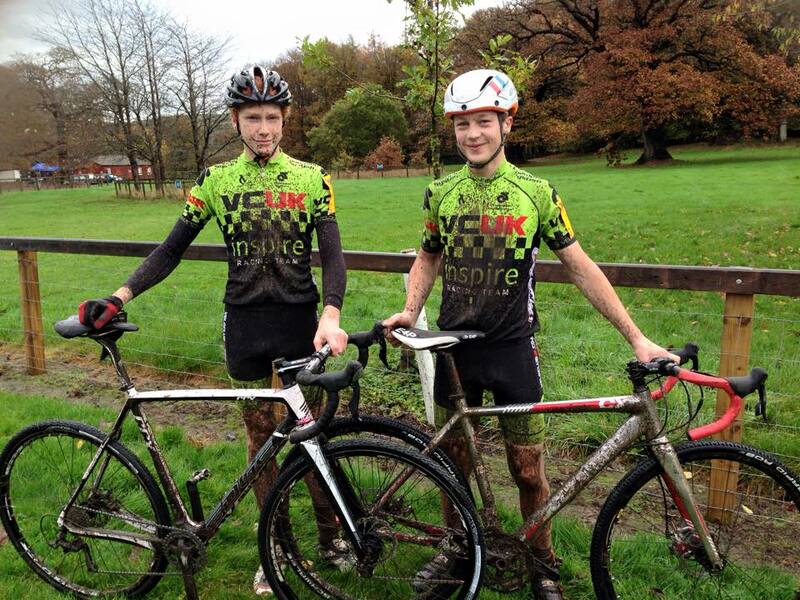 On Saturday the Inspire VCUK Racing Team had Cory Edmondson and Nathan Hawthorn racing in Cartmel and it proved to be one of the wettest days of the season so far! A great start to the race with Cory, Nathan and Isaac Peatfield (Bolton Hotwheels) making up an early leading group on a particularly short course for the youths that included long wet grassy sections that travelled downhill to some hurdles and then back up the hill through the woods. Cory and Isaac broke away quite early leaving all the other riders in their wake and then took turns to lead the race. Coming out of the woods on the second lap Cory failed to appear and Isaac was way out in front on his own. When Nathan passed the pits we then learned that Cory had suffered a mechanical and was being held up trying to free his jammed chain! Eventually Cory came into sight but was out of contention for the win as Isaac had now built a considerable lead ahead of Nathan and Tyler Koch. Lap by lap and bunny hopping the hurdles Cory was putting In a fantastic fight back whilst Nathan putting down an excellent performance to maintain his 2nd position. In the end, it was Isaac Peatfield that deservedly took the win, followed by a fantastic 2nd place for our own Nathan Hawthorn, with Tyler Koch rounding out the podium in 3rd place. A disappointed Cory rolled home in 4th but lived to fight another day! A contrast from the previous day with the sun shining but a little chilly from the clear sky at night. 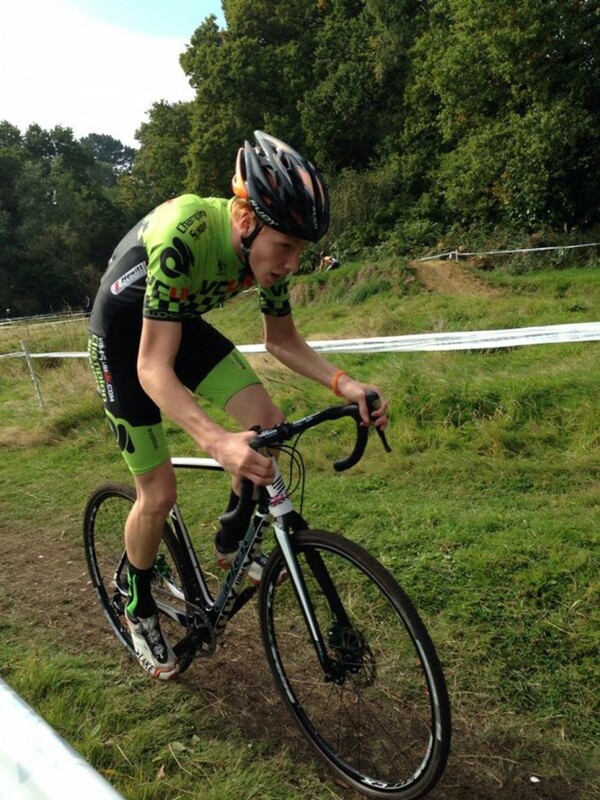 Cory Edmondson was the only VCUK rider to travel to Derby for the second round of the national trophy. 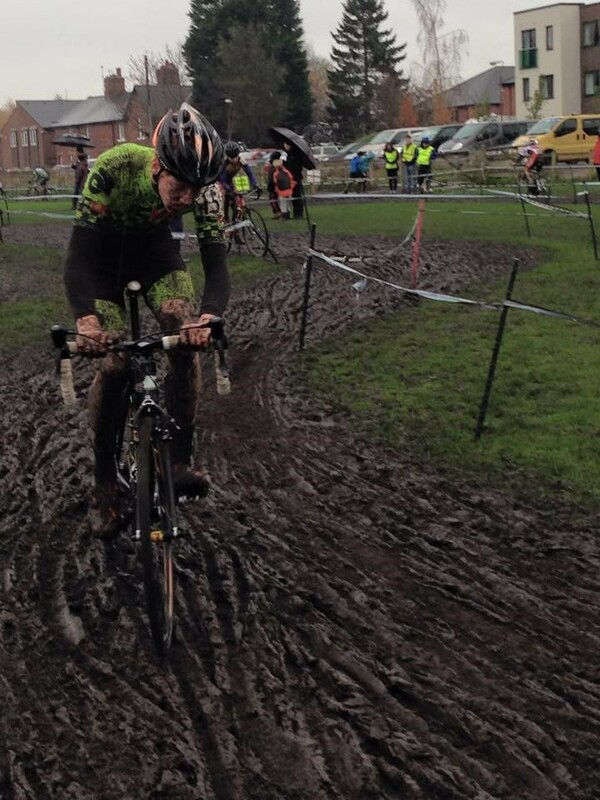 The course was relatively dry which is rather unusual and unexpected for the Derby venue. Around sixty national level riders were gridded and once the whistle sounded they pelted down the tarmac at high speed before hitting the green stuff. Cory had a great start and was placed around 10th. Ben Tulett took the early lead after bunny hopping the hurdles and immediately opening up a significant gap from Lewis Askey and Toby Barnes. 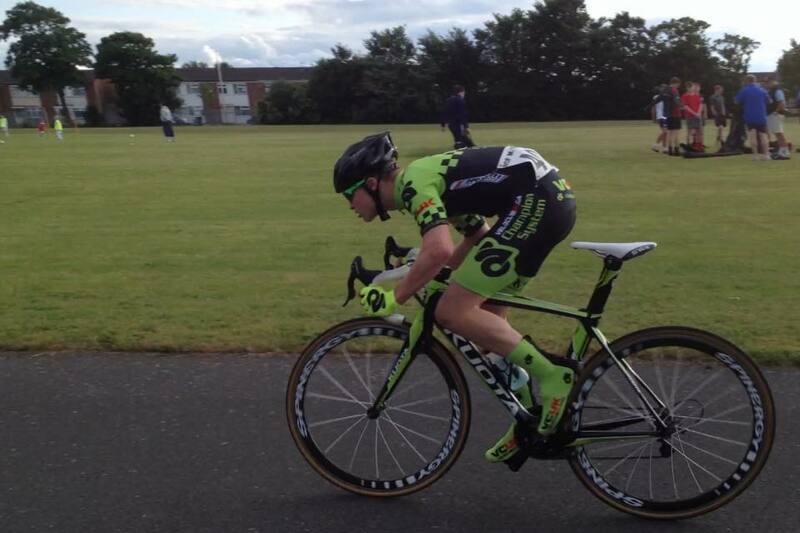 Euan Cameron was looking strong and chased the leaders throughout the race but never really threatened the top three. Ben Healy, Jenson Young and Craig Rogers were a few of the riders that followed close behind. A group with Charlie Craig and Matty Taylor were just ahead of Cory and at one point it looked as if he would join up but he never quite managed to bridge across. 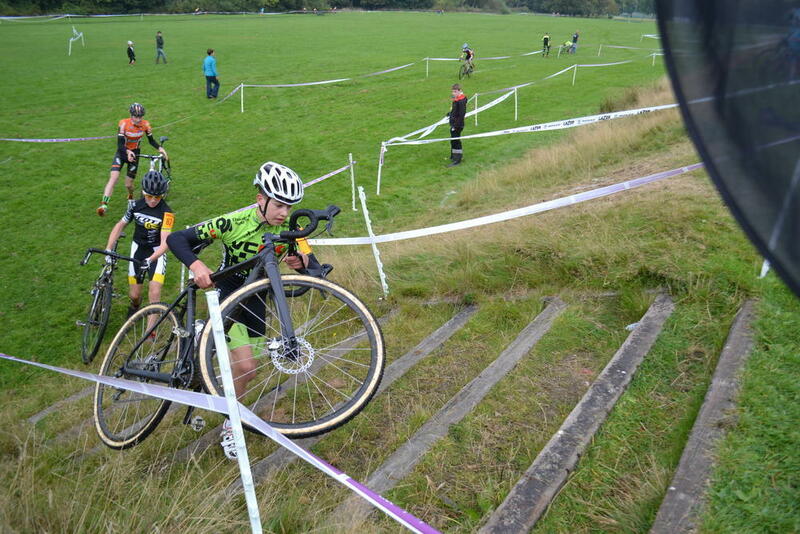 The course became quite slippery with off-camber sections and rideable steps but only a handful of riders manged to negotiate the steps. 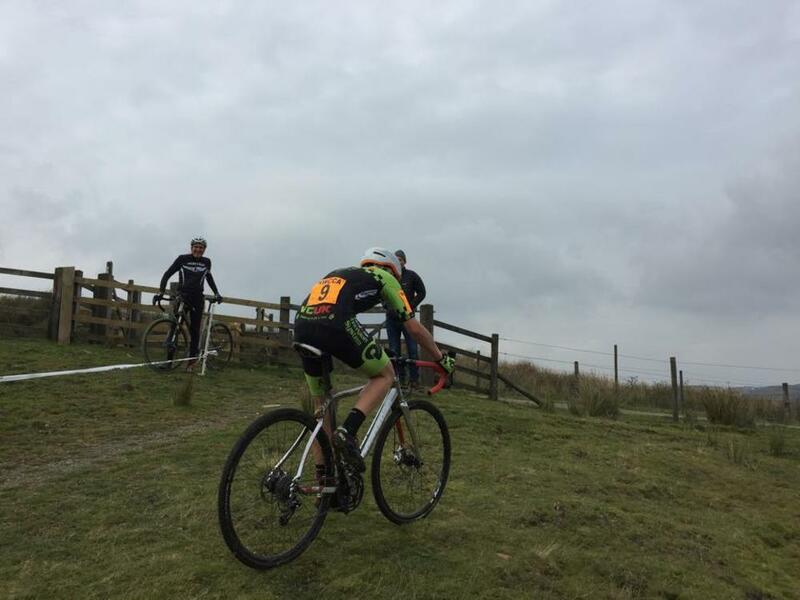 On Sunday the 11th of October, three of the team travelled to East Lancashire for Round Three of the North West Cyclo Cross Association League. 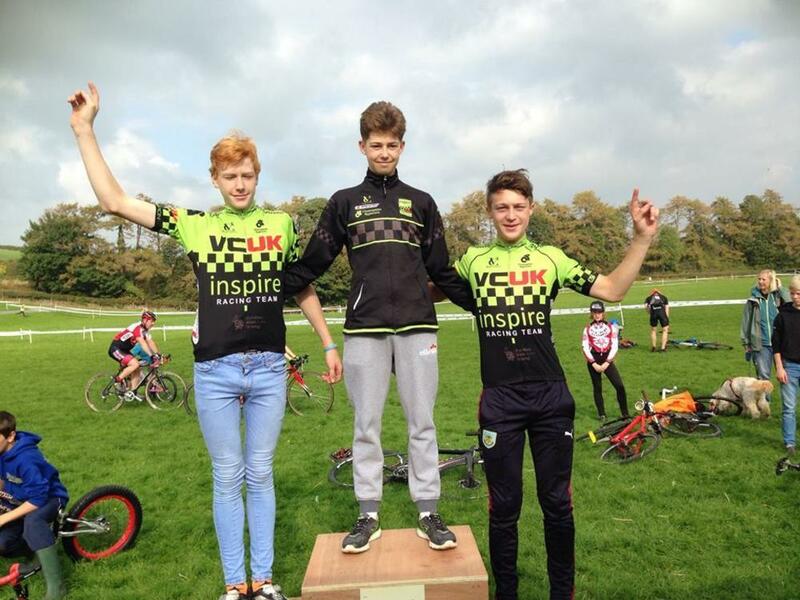 For this event the Inspire VCUK Racing Team were represented by Daniel Gibson, Nathan Hawthorn and Lewis Hartley. The venue is literally in the middle of nowhere, surrounded by quarries (and gypsies) on the top of an exposed moor. The dry weather has continued through into October and so the ground was again bone dry. The day started cold with a slight wind chill making it feel particularly autumnal high on the moor. 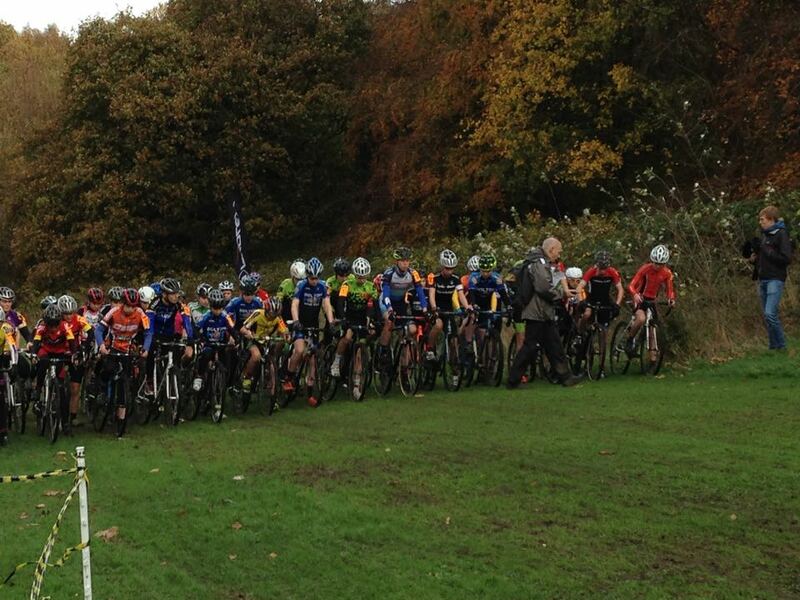 The moderate field of 33 riders took to the grid and set off for the 30 minute race at 10:50am. From the gun Charlie Craig looked to be on good form, joined by Lewis Hartley for the first couple of laps. Lewis was keeping up OK but wasn’t looking as good as previous weeks to be fair. Whilst negotiating an off-camber, Lewis’s rear wheel slipped out and his chain shipped off the cassette. This mechanical issue cost Lewis a significant gap to Charlie as he struggled to unjam the chain from between the cassette and frame. By the time he got going, it was game over in terms of contesting the win but that was far from guaranteed anyway looking at the pace Charlie was setting at the front of the race! 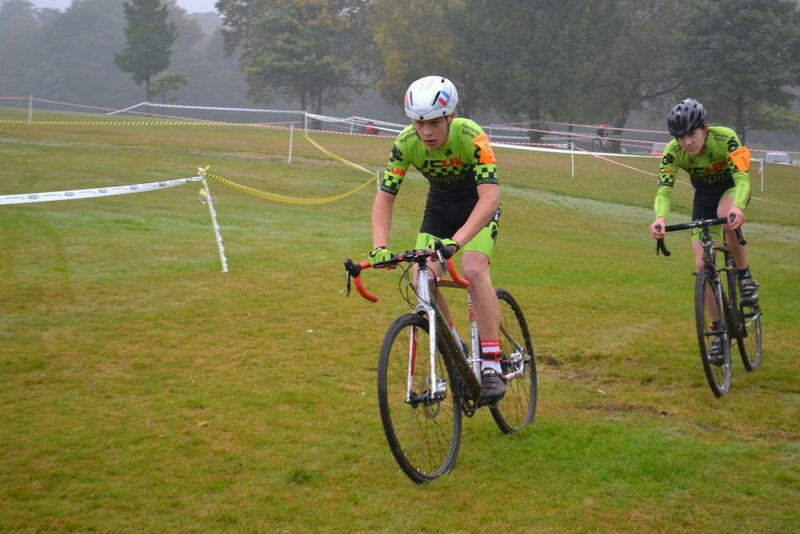 Nathan and Daniel settled into the race quickly and looked comfortable riding in 4th and 5th positions. In between was Isaac Peatfield, trying to stay with Lewis, and riding very well. 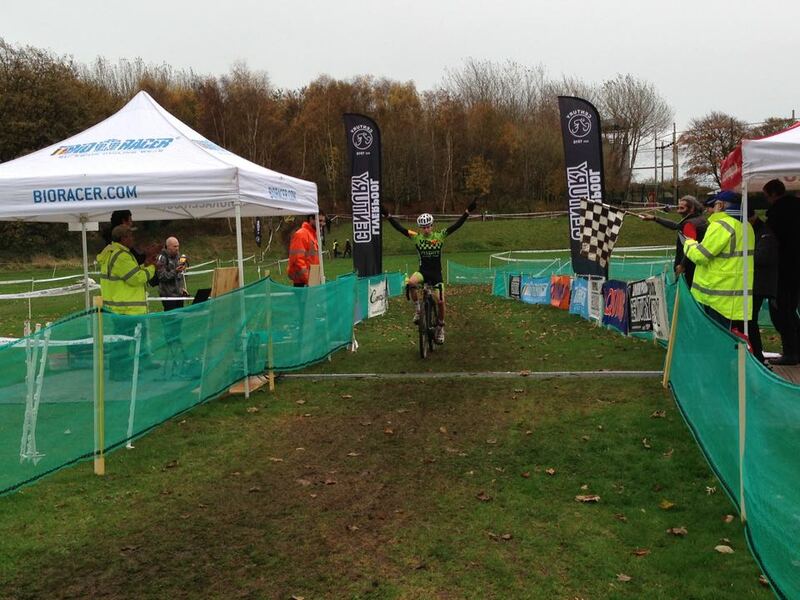 As the race came to a close, Charlie had gained a good half lap on the riders behind and took the win with ease. 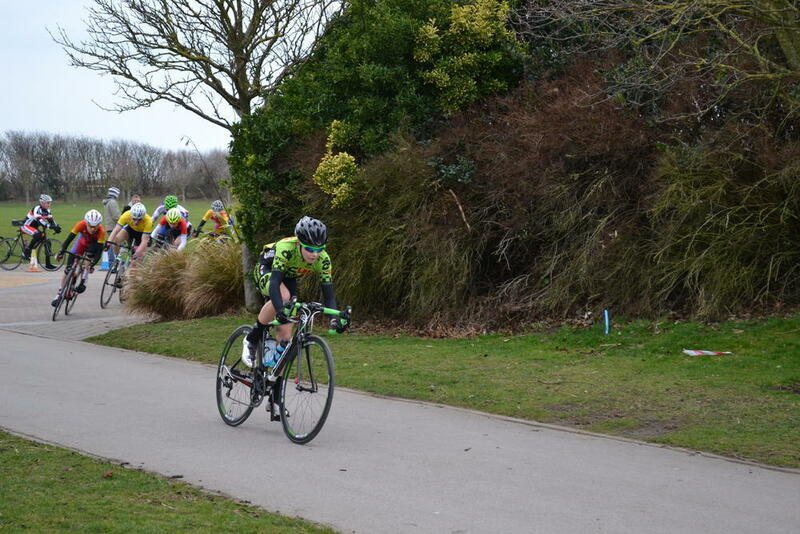 Lewis also rode home solo in 2nd place although he still maintained his 100% record for the league points! Cory Edmondson travelled to the event as the only Inspire VCUK representative. The report that came back noted a fantastic venue and super weather…so worth the long journey. 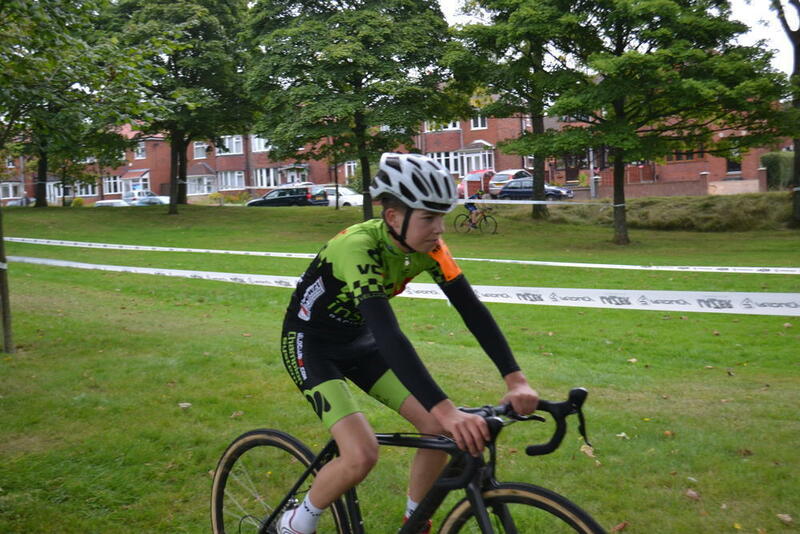 As you would expect, the U16 boys race started very fast with Cory getting away safely with eventual winner Toby Barnes and former national champion Euan Cameron. 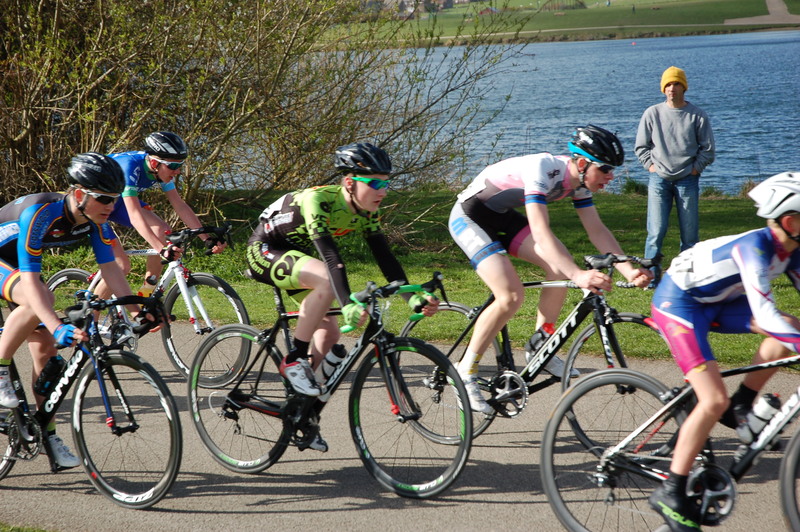 Other strong riders joined the leading group soon after, including Ben Tulett and Lewis Askey. 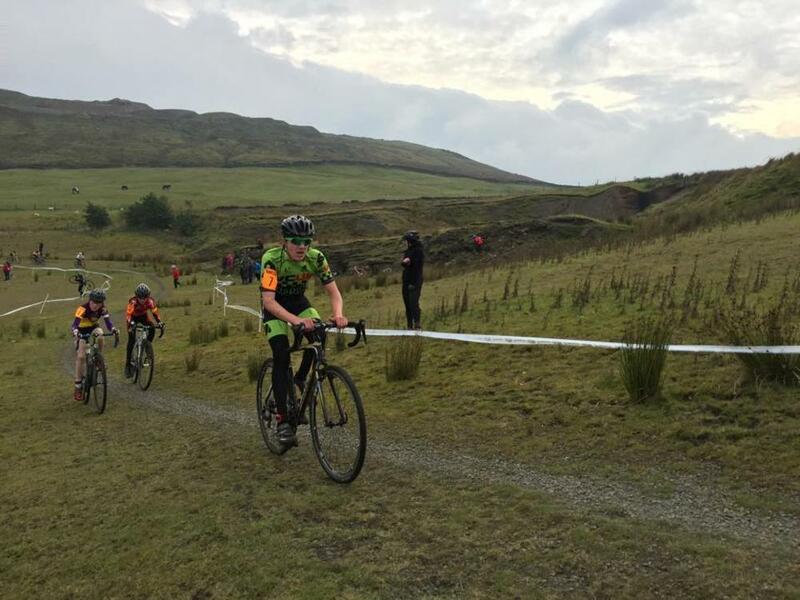 This is the first time the venue has been used by the NWCCA and on reflection it was just perfect…in fact, it was that good that we will be recommending it for future Trophy events. 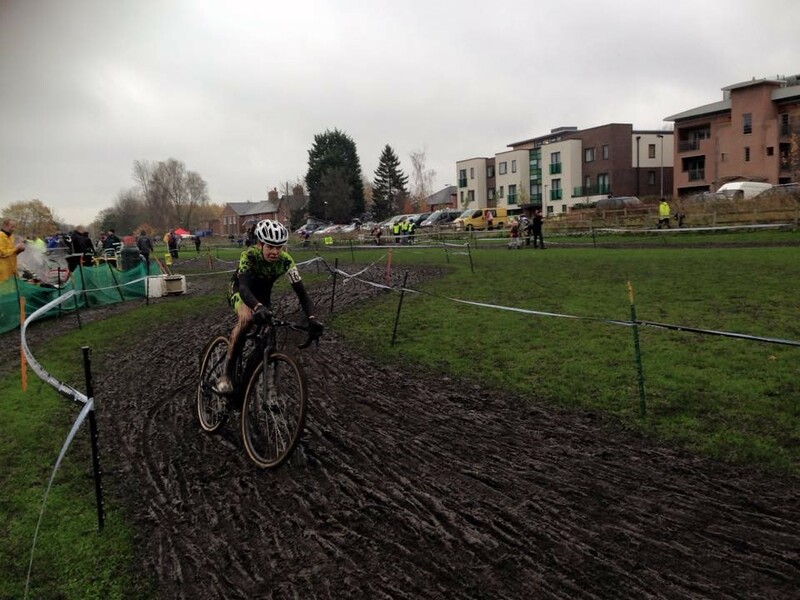 There was ample parking, changing facilities, and superb terrain for making a real spectacle in CX racing. 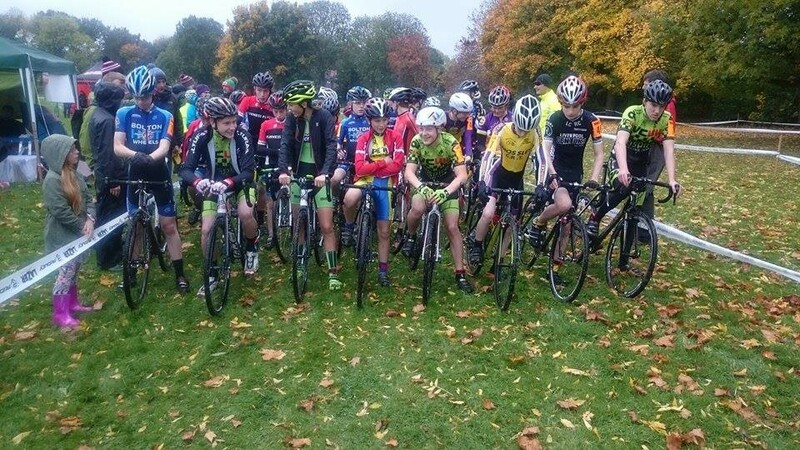 Nathan, Cory and Lewis were joined by around thirty youth riders who assembled at the entrance to the park to begin their race. An air horn was used to signal the start on a gravel track that passed through the finish area before veering off uphill and on to the green stuff. 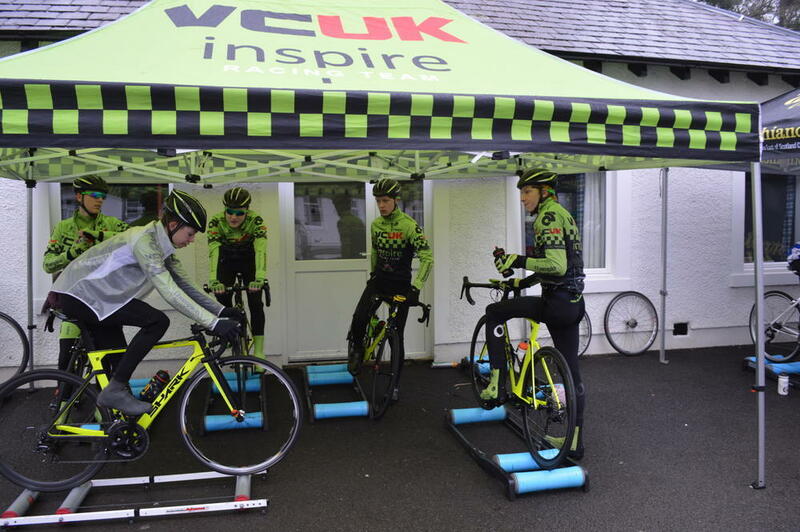 None of the Inspire VCUK riders were at their best to be truthful…having picked up sore throats in the week and suffering with the early stages of a cold. So to be in the lead and dominant in their second race of the weekend was impressive. 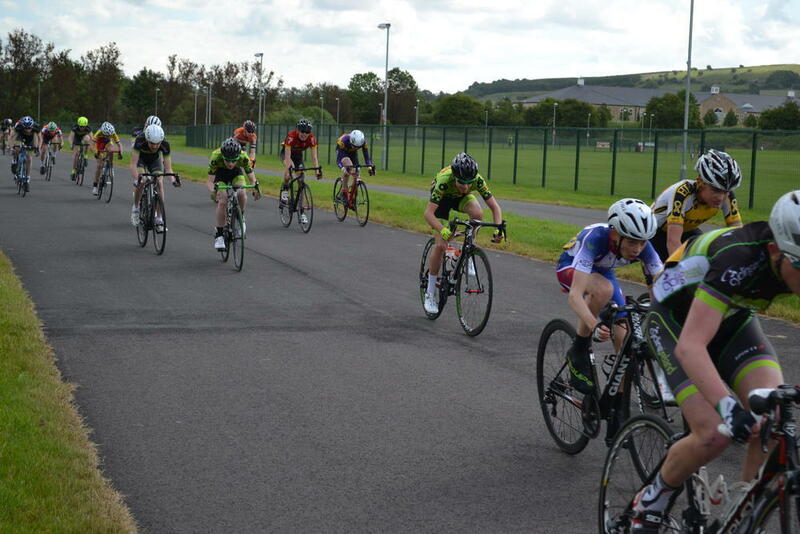 By the time the riders were on their final lap, Lewis had gained an unassailable lead, lapping most of the field, whilst Cory and Nathan were battling it out for the 2nd place. 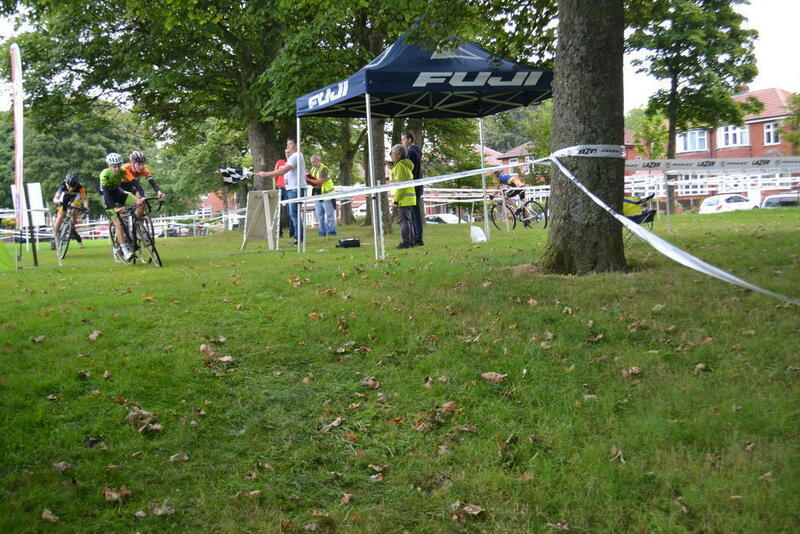 Unfortunately Nathan punctured just before the pits and was forced on to a mountain bike, thereby having to settle for third. 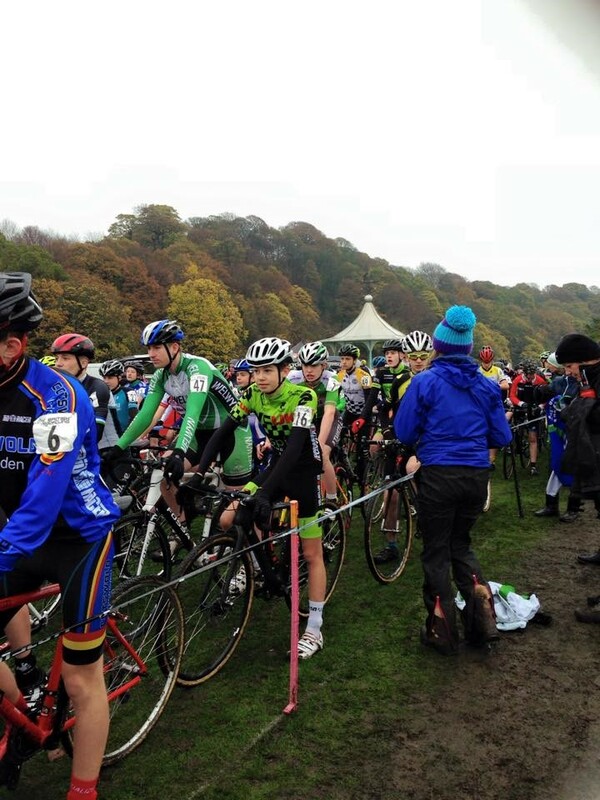 On Saturday the 3rd October, the team assembled in Heaton Park for Round Three of the North West Cyclo Cross Association League. 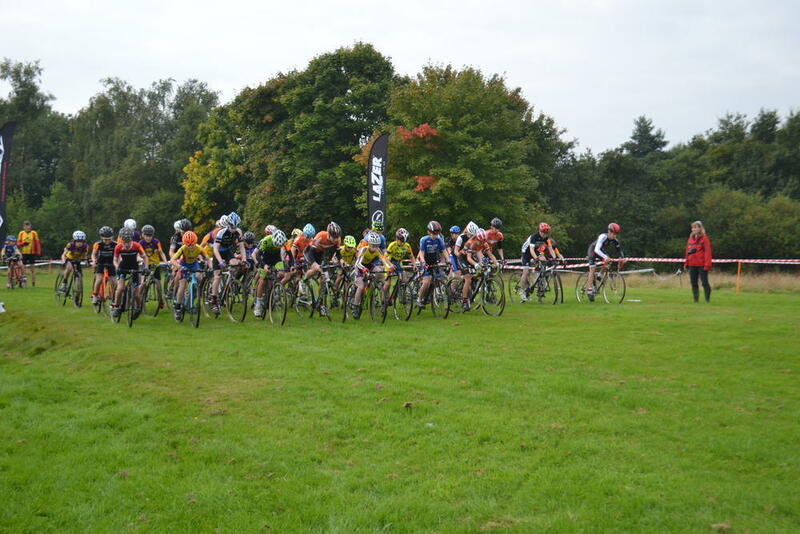 This venue is on the edge of Manchester and offers a very large expanse of Victorian greenbelt ideal for this type of racing. The venue will also be used later in the season for the North of England Championship but no doubt more rain will have fallen by then! We arrived in Llandudno late afternoon with glorious weather that was forecast for several days ahead! 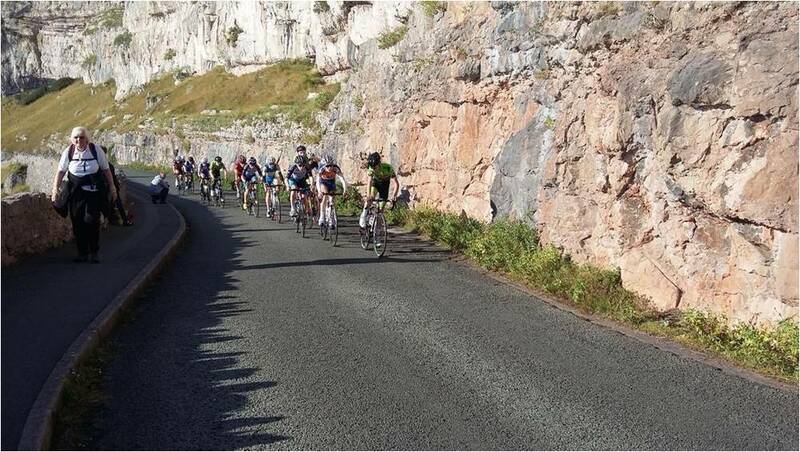 After checking in at the hostel, it was decided to take a road trip around the Great Orme circuit so that all the riders could familiarise themselves for the following morning. It was an early start on Sunday as the racing started at 9am. 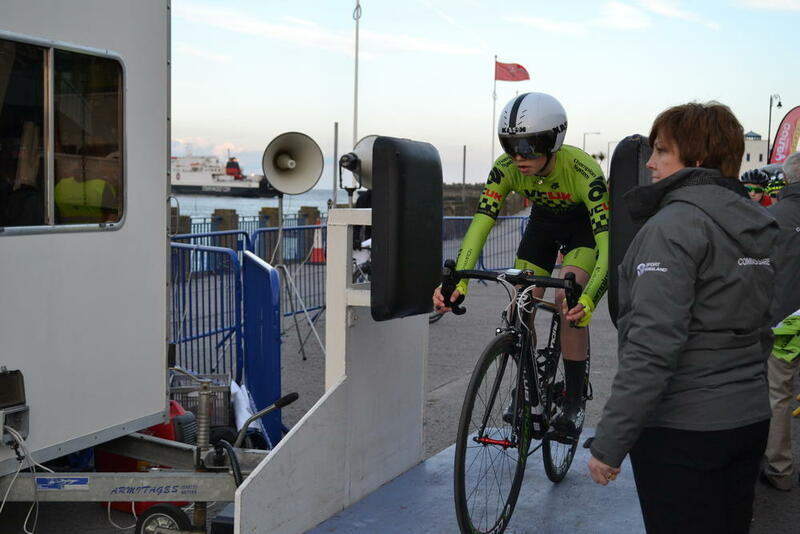 After signing on the riders rode along the promenade to the bottom of the Great Orme road where they then began their 20minute traditional warm up on the rollers, making sure their legs and lungs were ready for the race ahead. The finish is a frantic one, as the riders pass the Grand Hotel the course dips slightly before rising for around 200 metres before reaching the timing mat. The race speed was over 30mph as the riders began their sprint for the line. It was Jack Ford from Holmfirth CC who took the win followed closely by Brad Dransfield from the Kirklees Academy and then Huw Owen from Energy Cycles in third. In the same group was Halley Woods in 6th and Lewis who was pipped into 8th, both very commendable results for 1st year riders. The whole team gathered at Victoria Park in Southport for the 6thand final round of the North West Youth league. Beautiful sunny weather greeted the riders and this is how it would stay for the remainder of the day. Yes, this is the time of year when riders/managers decide if they are staying with the team or departing to pastures new. Through mutual consent, it has been decided that Halley Woods will leave the team and we have wished him good luck for next year. 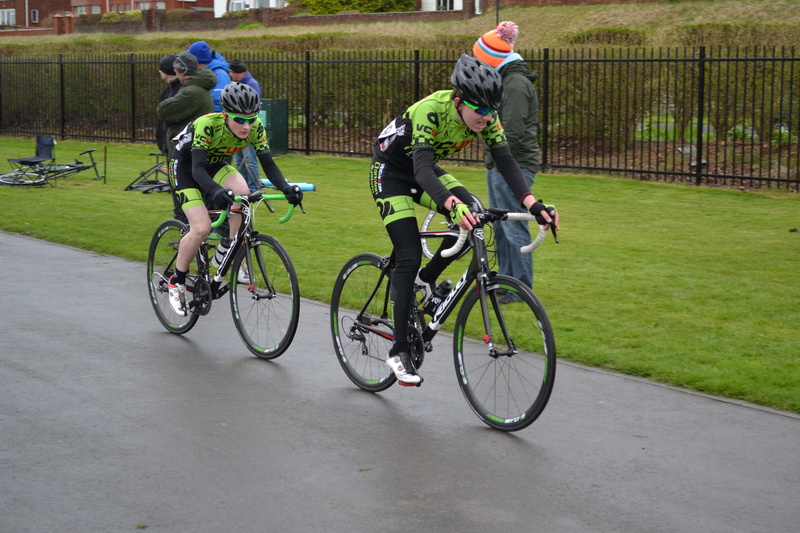 Arriving into the team are two youth A riders from Cycle Sport Pendle (East Lancashire). 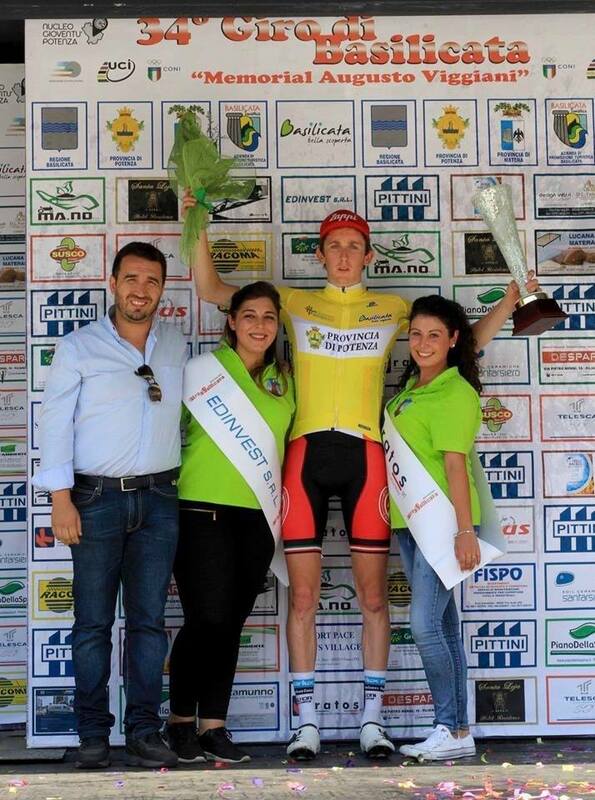 Nathan Hawthorn, prolific winner in regional level criteriums, bags of potential with a good bunch kick. 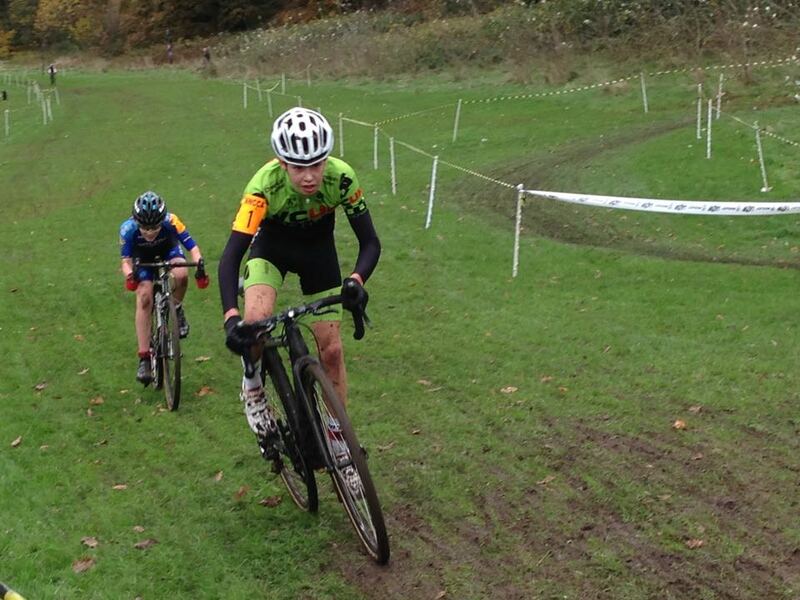 Cory Edmondson, very good CX rider, developing road rider, also with bags of potential going forward. 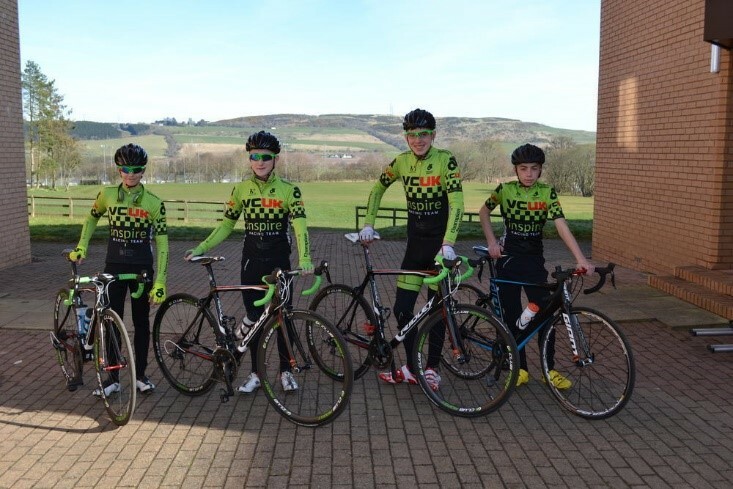 These new riders will bolster our team for 2016 with the aim to prepare for 2017/18 junior road racing. Both riders have begun riding for the team with immediate effect. 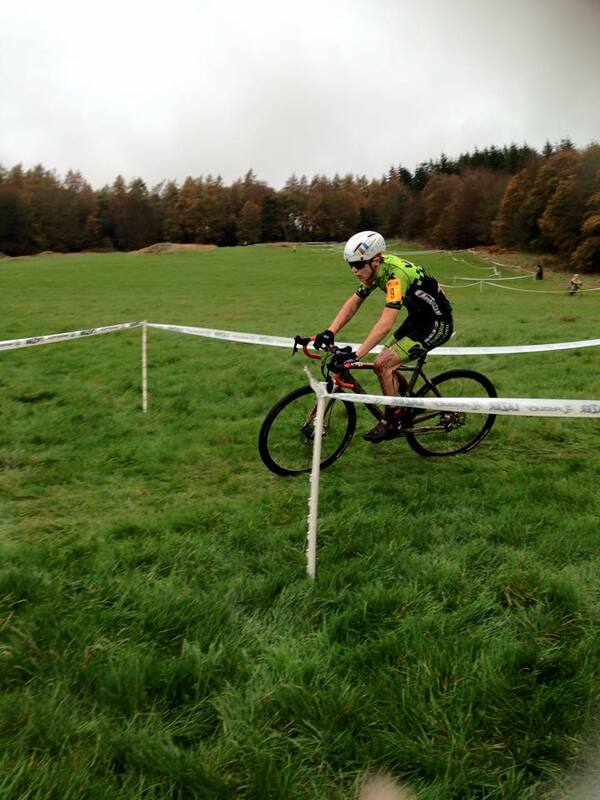 Last weekend brought Round 2 of the 2015/16 Cyclo-Cross season, and after a successful Round 1, Lewis was keen to put down another strong performance. 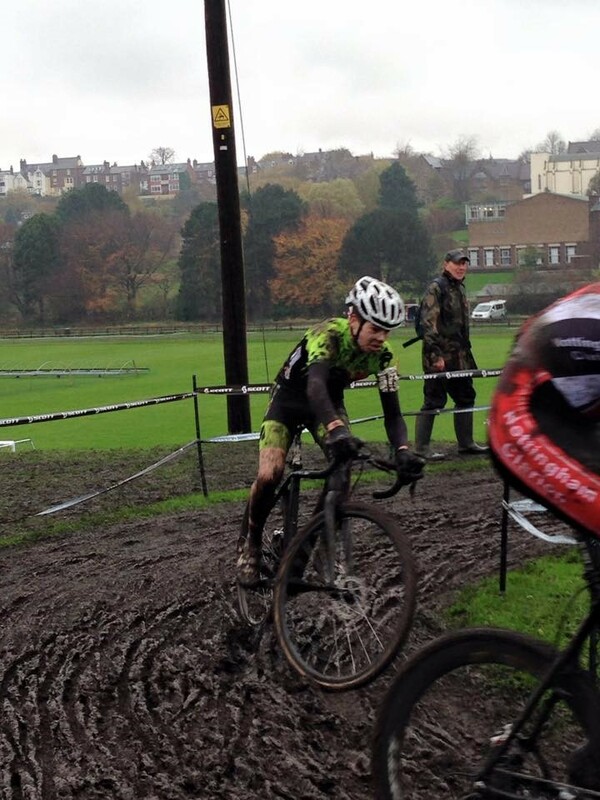 Horwich CC have a reputation for laying down the very best of Cyclo Cross courses and they did not disappoint this time. 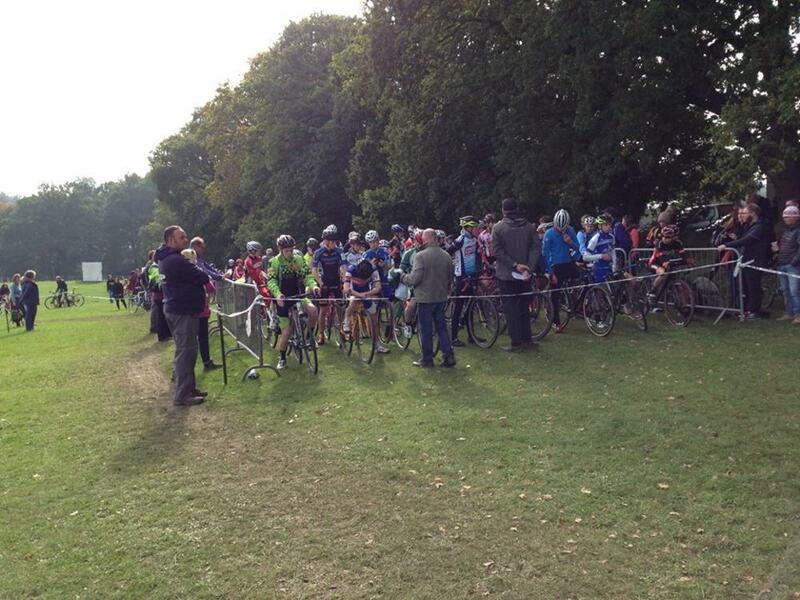 The course utilised the entire park and was designed for powerful riders accustomed to road racing! The course included several very long and flat “power” sections, providing an opportunity for riders to put the power down and stretch the opposition. The weather on the day was very good, starting with a morning mist and heavy dew that developed into bright sun and dry grass. No mud to be seen anywhere! Over thirty youth riders lined up on the main field in anticipation of the starting whistle and once it blew, the riders accelerated away into the far reaches of the park. Lewis did not have a particularly strong start this week, struggling to clip in and then having to make his way to the front of the pack. As the riders approached the pits for the first time, three had managed to gap the rest of the field: again Cory Edmondson was in the mix alongside Charlie Craig, with Lewis leading the way. It was Lewis who seemed to be on the front for most of the race, with the other two contented to ride at his wheel. Occasionally Charlie came through to do a strong turn to see if he had the strength to gain some ground but as the race entered the final lap it became clear that these three were staying together to fight for the victory. 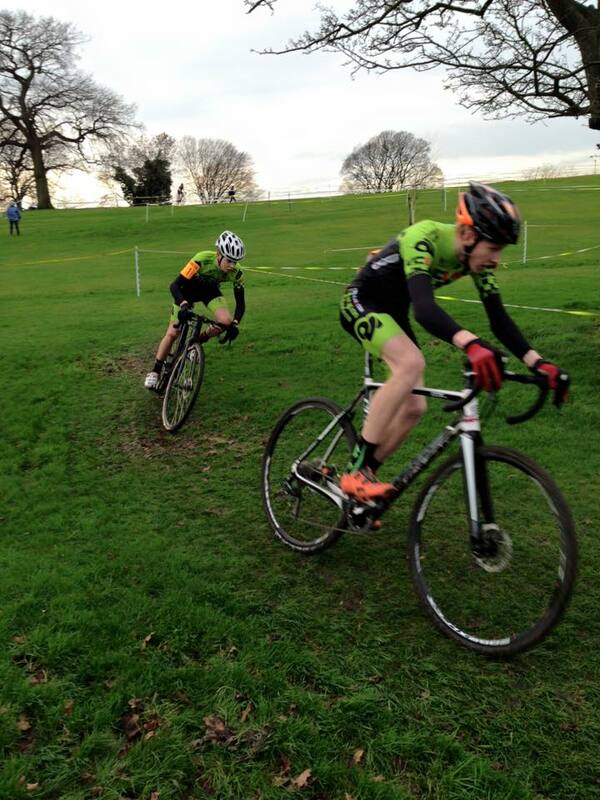 Last weekend brought the opening of the 2015/16 Cyclo-Cross season, a form of racing undertaken in winter months that is great for maintaining fitness as the weather deteriorates, and also helps riders to develop good bike skills that may well come in useful at later stages in their road careers. 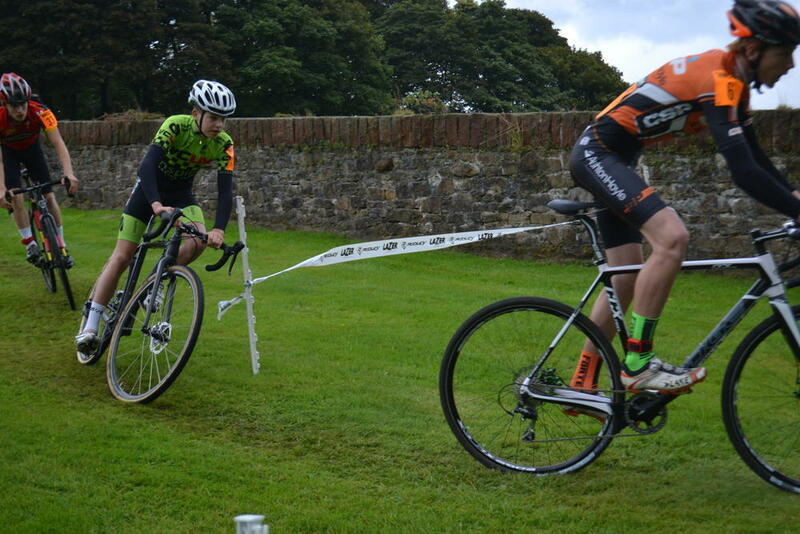 The first race in the North West Cyclo Cross Association (NWCCA) league was held at Hoghton Tower, nestled between Blackburn and Preston. The grounds of this stately home provided a splendid location for the first event organised by the Red Rose Olympic Cycling Club. 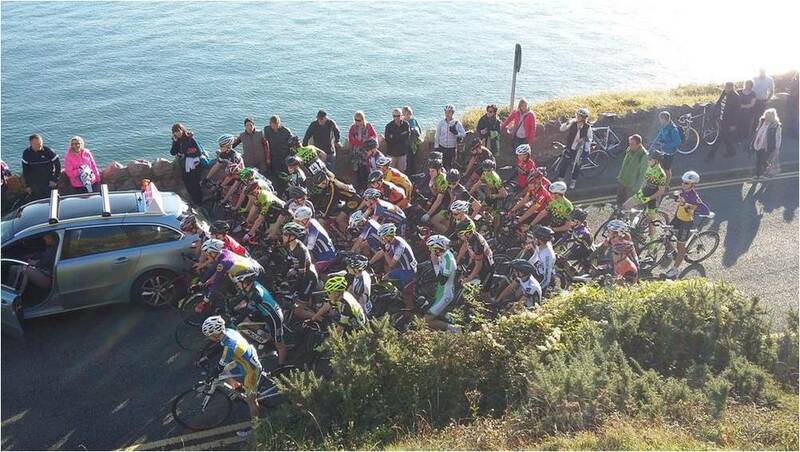 Over forty riders lined up on the inclined driveway facing up towards the grade 1 listed tower, originally built in 1109AD, quite an impressive way to begin a race. 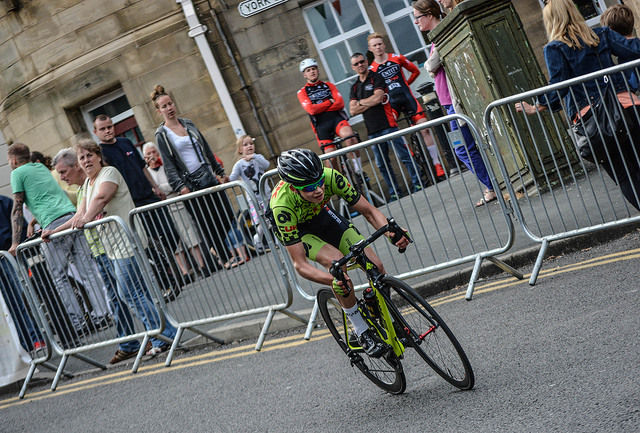 As the flag dropped and the riders blasted up the driveway it was Cory Edmondson from Cycle Sport Pendle who took up the lead by the time the riders reach the tower. After half a lap, two riders had joined Cory at the front of the race: Lewis Hartley from the VCUK Inspire Racing Team and Craig Rogers from Birkenhead North End. These three were all keen to put a marker down in the first event and it didn’t take long for short sharp attacks to come from Lewis and Craig, which put Cory under pressure who was eventually distanced. As the laps passed by it became clear that Lewis had the edge on the technical aspects of the course, managing to gap Craig but also allowing him to get back on for a few laps before making a really hard dig in the latter half of the race to forge an unassailable lead. By the time Lewis passed the finish line for the penultimate time and the lap bell rung out, he knew he had the win in the bag, bar any punctures or mechanicals, and was able to ride to a comfortable victory. 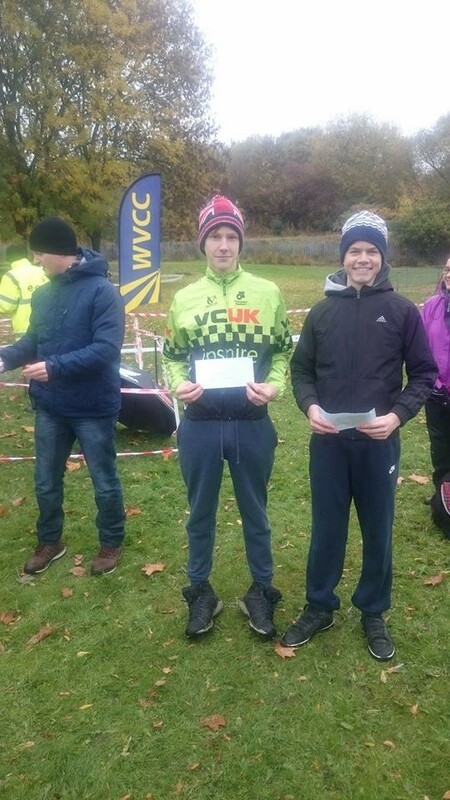 On Saturday, Halley Woods and Lewis Hartley rode at the Steven Burke Hub in Barrowford, taking 2nd and 4th place respectively in the youth A race, before going on to ride in the senior event for additional training! 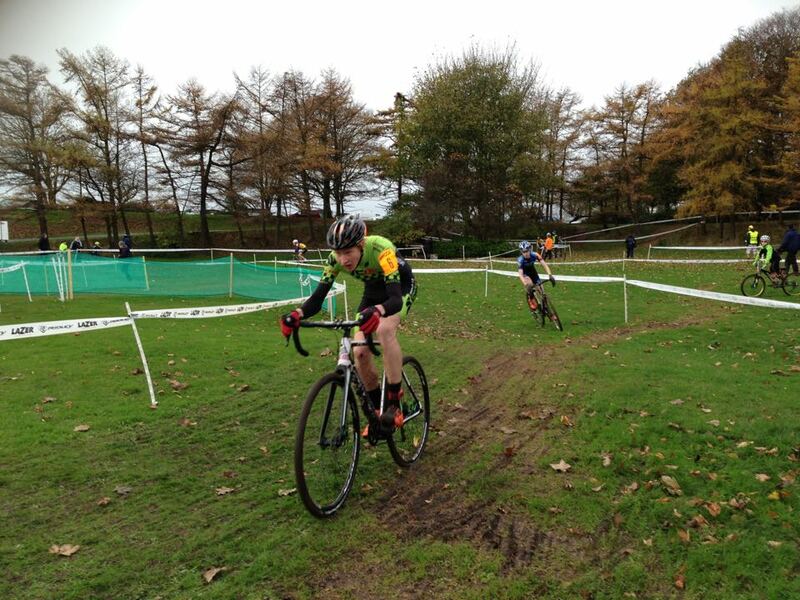 On Sunday, Halley Woods, Daniel Gibson, Luke Cheetham and Tom Ashcroft all rode at Tameside in the North West Youth League. 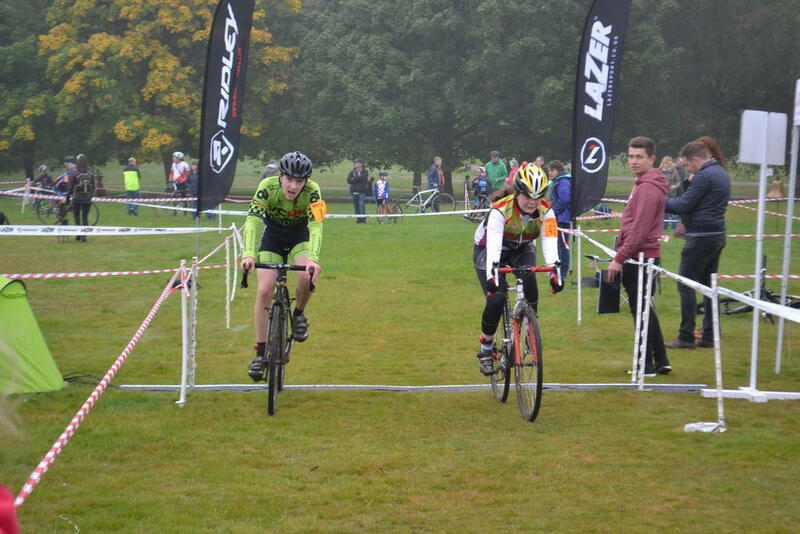 In the Long Youth A Race, Luke came 4th, Daniel 6th and Halley 8th. 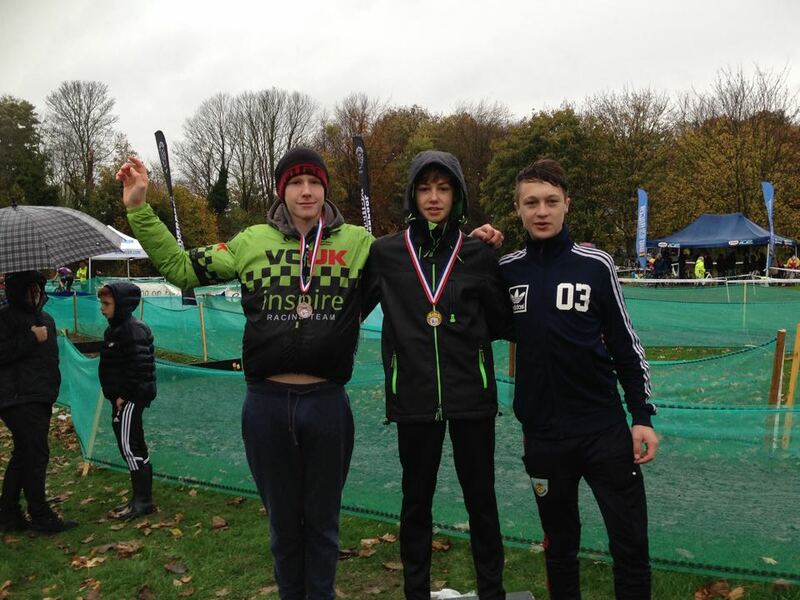 In the Short Youth A Race Daniel was 4th, Halley 5th and Luke 12th. 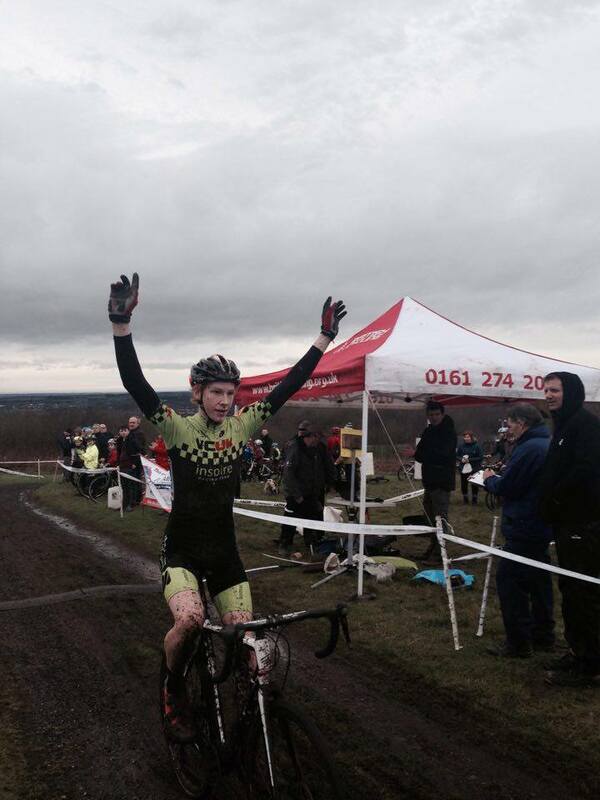 Tom Ashcroft won the Short Youth B Race and was 2nd in the Long Race. 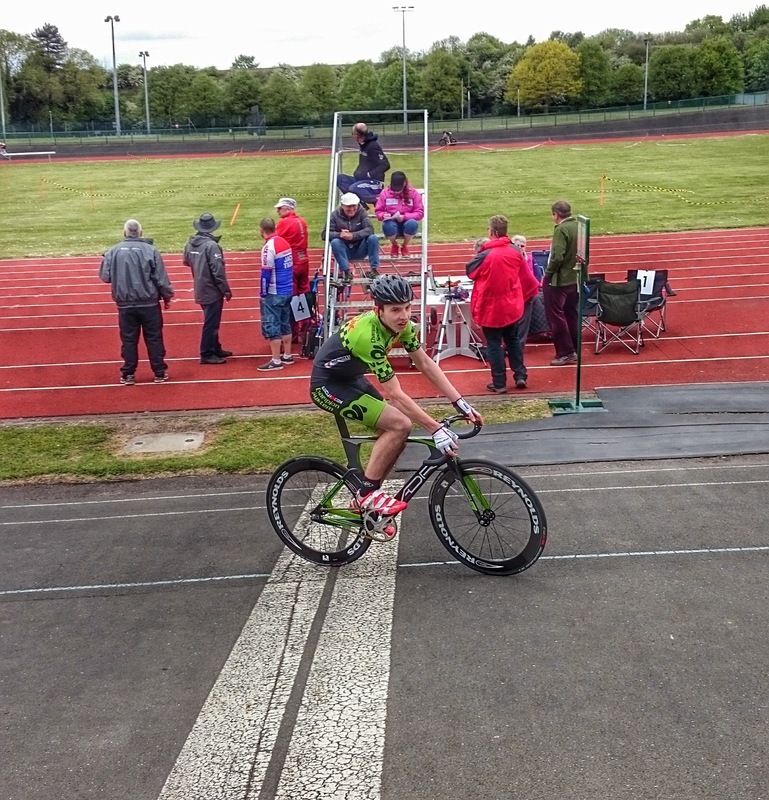 Meanwhile, Lewis Hartley competed in the Category 2/3/4 senior race at Preston Arena on Sunday morning, competing against one of our sponsors Tim Lawson from Secret Training CC. Tim managed to finish in 3rd place for the podium whilst Lewis sprinted home to 7th, having done a considerable amount of work during the race. 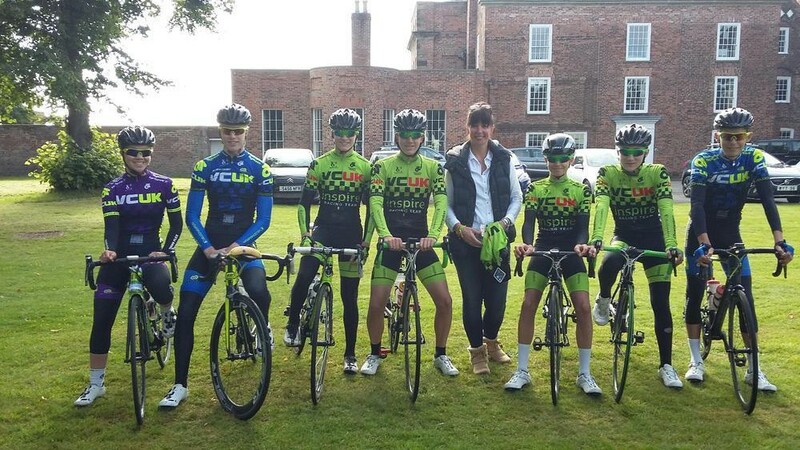 On Sunday 16th August, the VCUK Inspire Racing Team, along with members of the VCUK junior and women’s team, assembled at the historic and peaceful setting of Meols Hall in Southport to participate in the fourth annual Ben Gautrey Cycle Challenge. 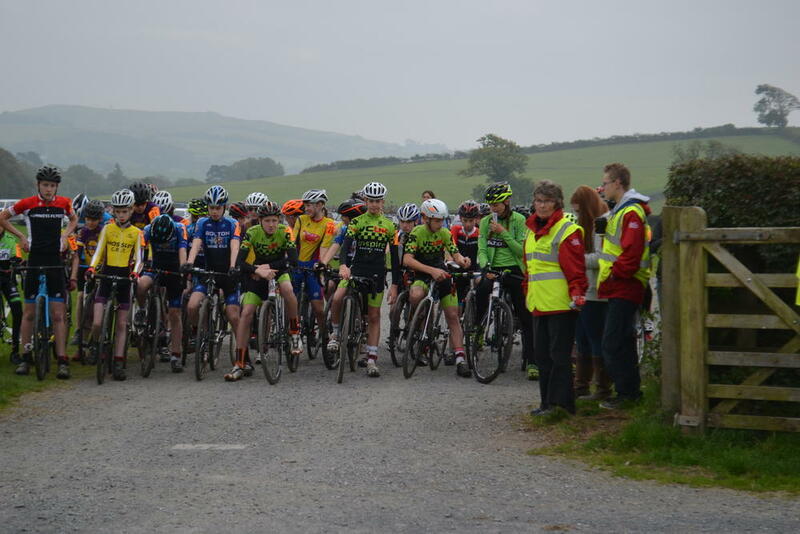 Over 150 riders joined together to participate in the fund raising event held in memory of Ben. 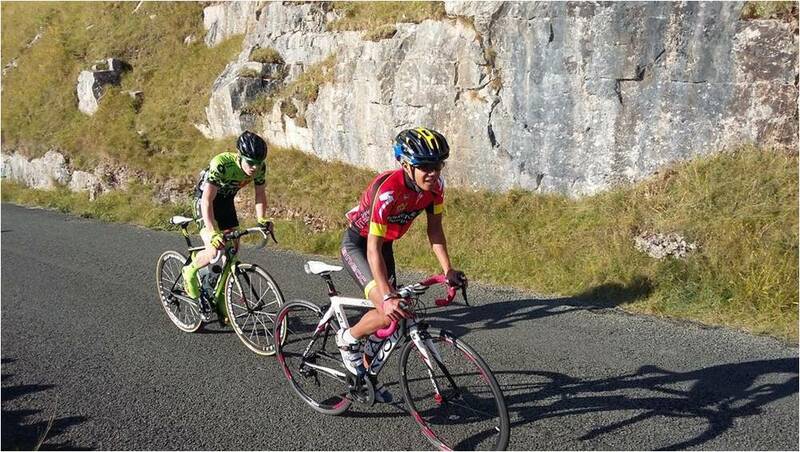 Last Saturday, Lewis Hartley travelled up to the South Lakes to participate in the Wigan Wheelers Charity 10 Mile Time Trial on the L1015 Levens course. 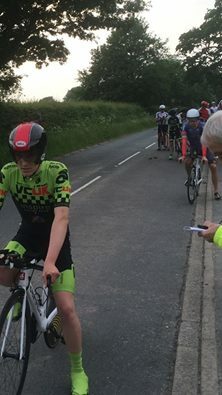 Lewis managed to record a PB of 22 minutes and 34 seconds, averaging around 26.6MPH.The event was won by Lewis’s older brother Adam Hartley who rides for the VCUK Junior Team with a time of 19 minutes and 51 seconds, averaging over 30MPH. This event is traditionally the last in a series of evening time trials and the only hill climb in the series. This year it was held on the locally notorious Snow Hill climb that runs up past the Apple Store in Scorton. 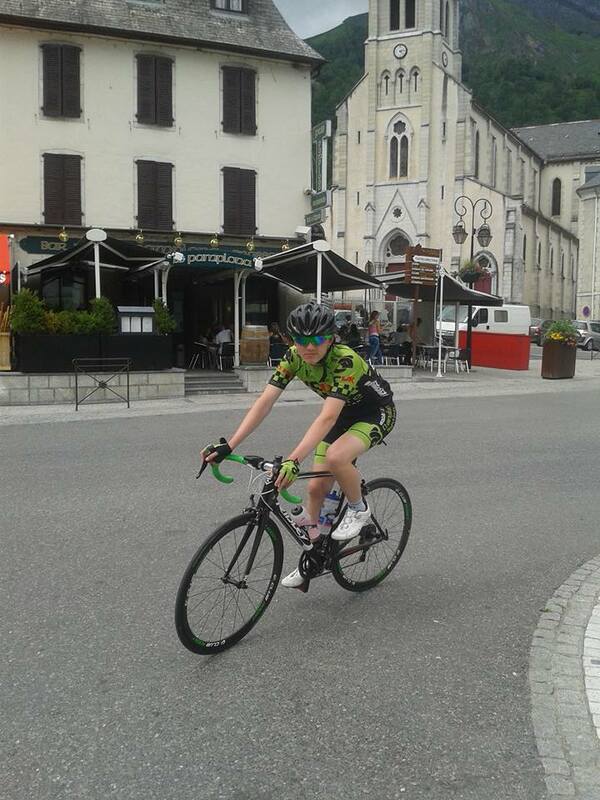 Lewis managed to ride up the climb with a PB of 3 minutes and 18 seconds, finishing in the top 10. 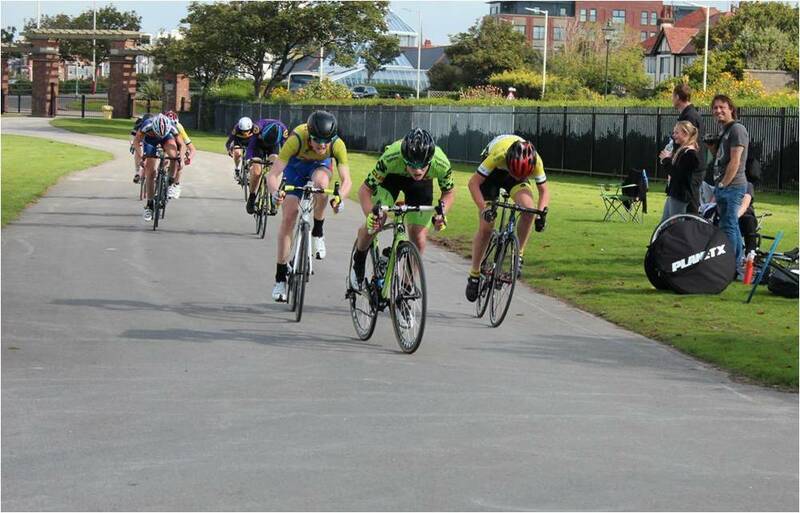 The Litherland Closed Circuit Racing League concluded this week with the final event being held on Wednesday the 19th August. Both Daniel Gibson and Tom Ashcroft have regularly attended these weekly events, with Daniel competing for the Youth A title and Tom the Youth B. 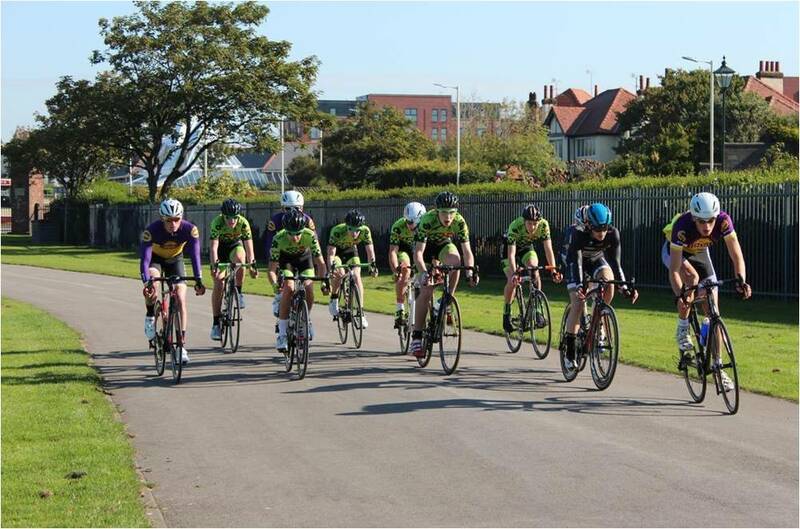 After 20 rounds, Daniel managed to finish 2nd in the league with Daniel Salcedo being crowned the winner from Southport Cycling Club. During this campaign Daniel managed to win on 4 separate occasions and competed hard every time he turned up. In the Youth B campaign, young Tom “the Assassin” Ashcroft totally dominated affairs, winning 12 events and taking the league title. 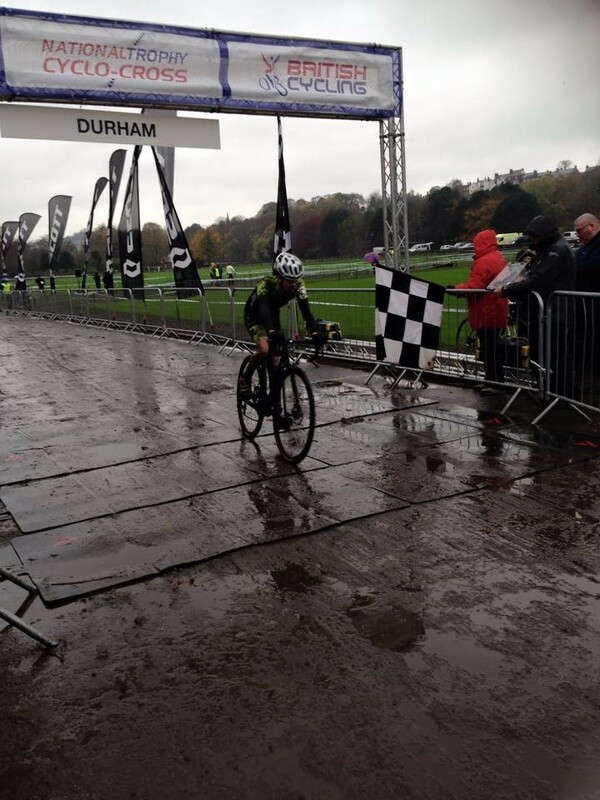 After securing the title, Tom began riding up in the Youth A races (with dispensation) and impressively won the final three rounds of the A category races even though he is technically a youth B rider. Lewis and Luke competed in the latest round of the North West Youth League, this time at the Palatine Circuit in Blackpool. 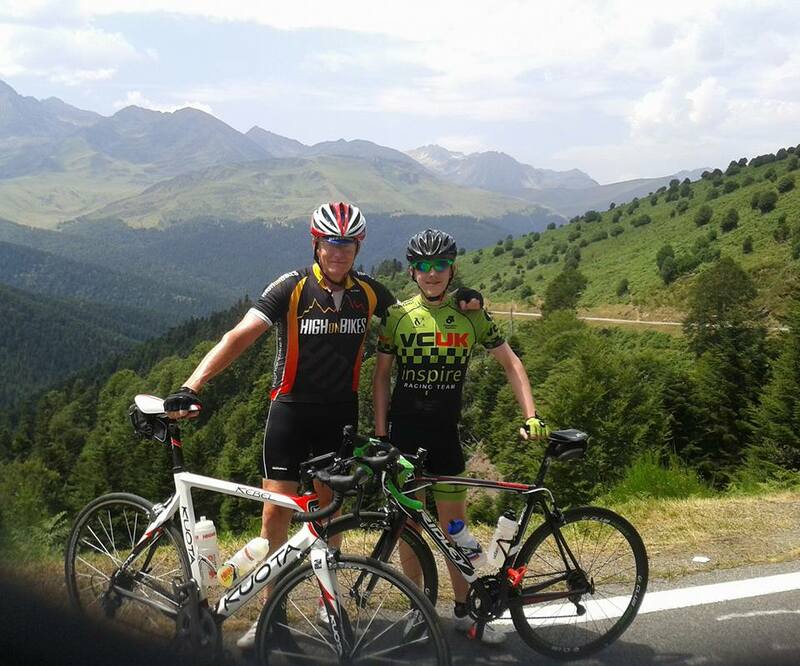 Meanwhile Daniel Gibson jetted off to the Pyrenees last week on a cycling holiday/training camp – report to follow. 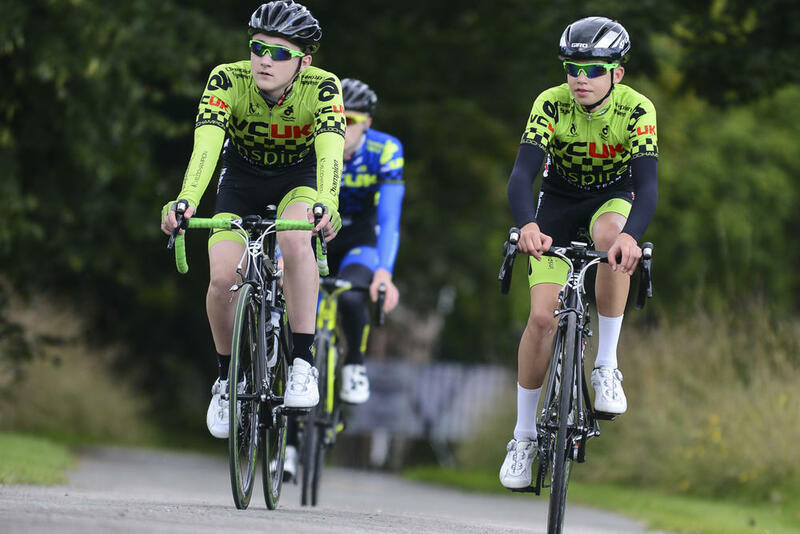 On Saturday, the whole team assembled in Colne (Barrowford) at the Steven Burke Cycling Hub, for Round 3 of the North West Youth League. The weather was very good and there seemed to be a good turnout. 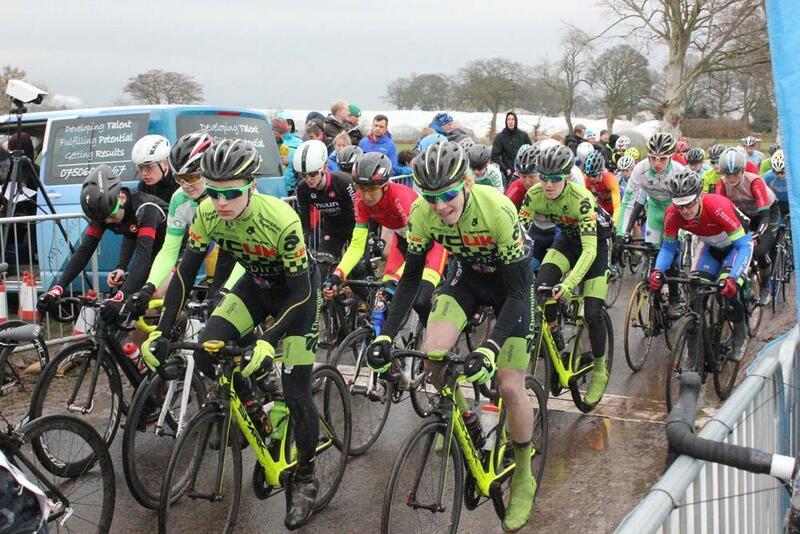 In a contrast to previous rounds, a large contingent of Irish Academy riders had travelled over for this event using it as a basis for selection for some future stage races. 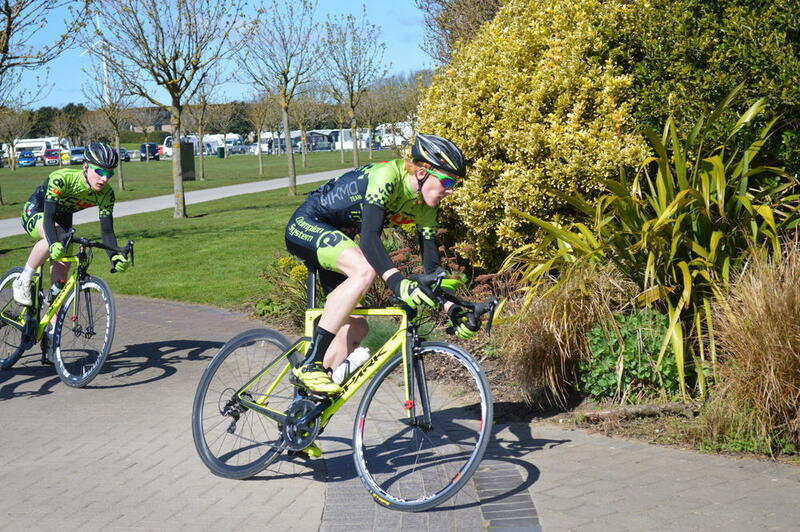 This week saw Lewis Hartley break his 10 mile time trial personal best not once but twice. 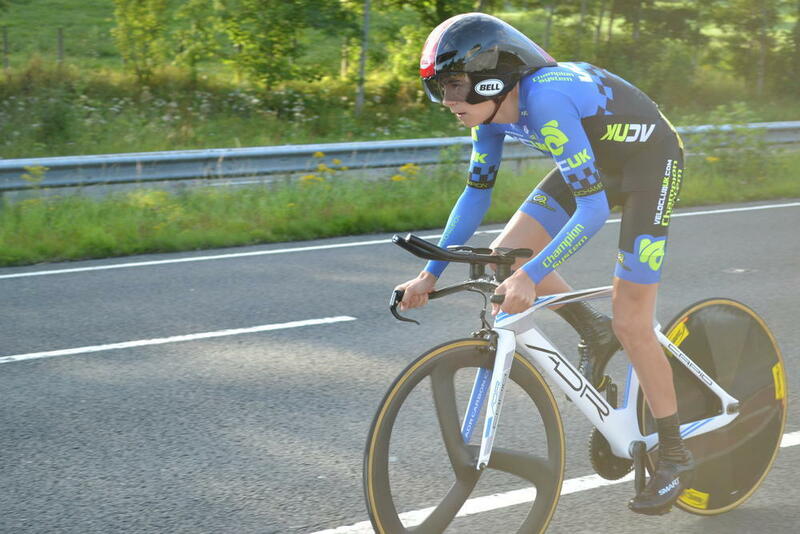 On Wednesday, Lewis rode in the Kent Valley RC Club 10TT held on the Levens course, in the South Lakes. The weather was good, with very little wind and warm conditions. 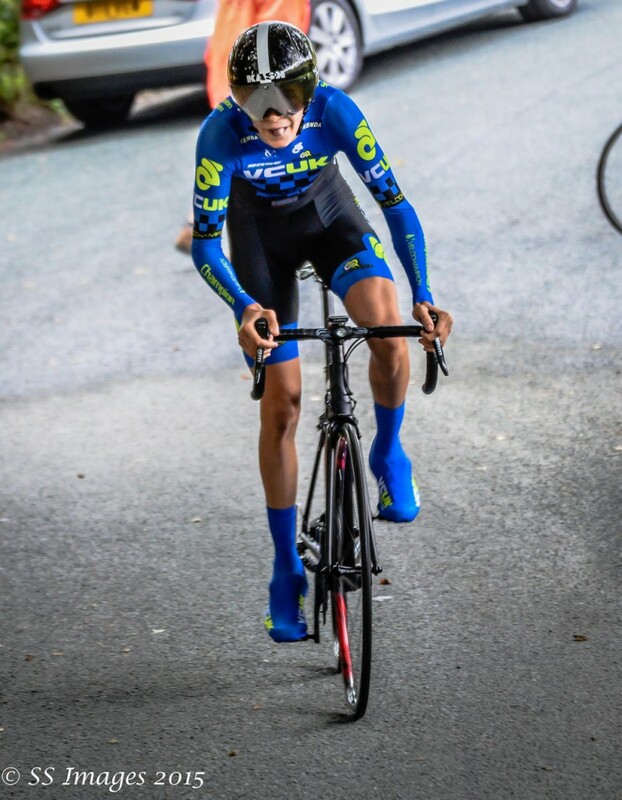 Lewis rode “fixed gear” using his ADR track bike set up with the BC youth gear restriction (49 x 15T) or 88inches in old money. His previous PB from 2014 was 23:15, but on Wednesday, he managed to go under 23minutes with 22:45. 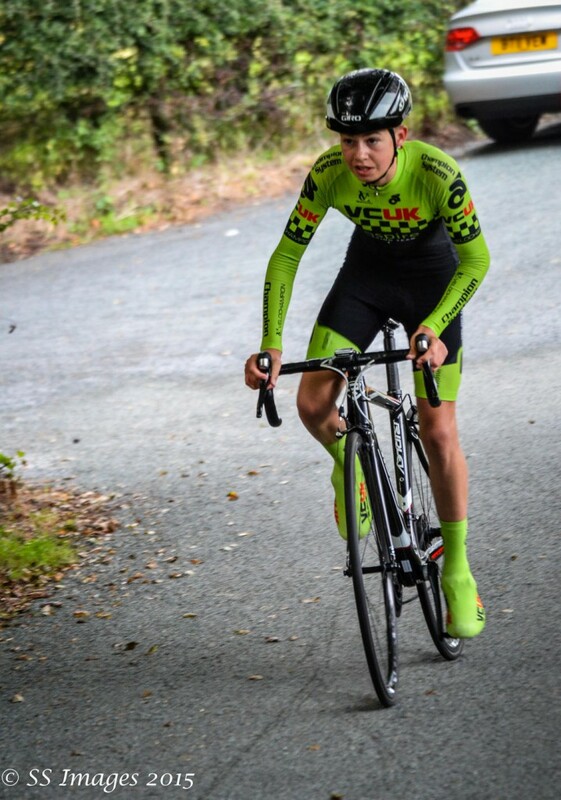 His older brother, Adam Hartley, a 1st year junior riding for the VCUK PH-MAS Junior Cycling Team, won the event with 19:48 gaining a new PB himself. 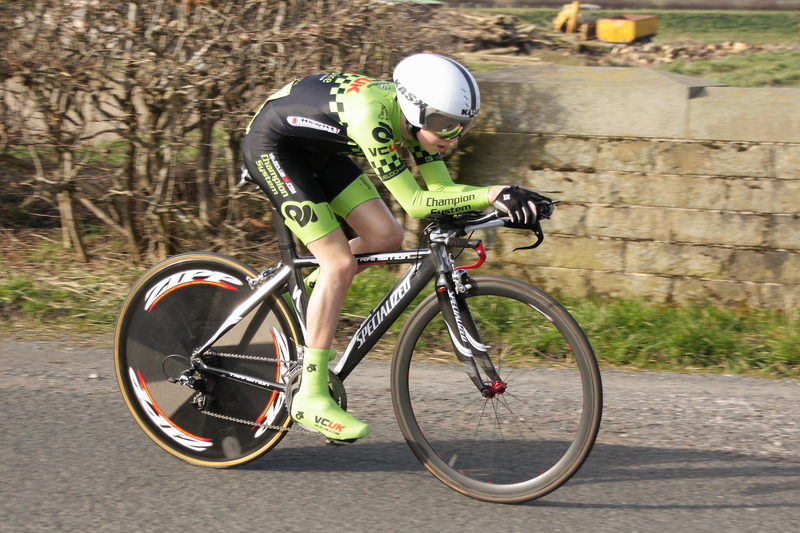 Later in the week, Lewis headed back up to Levens to ride the Lancaster CC 10TT. 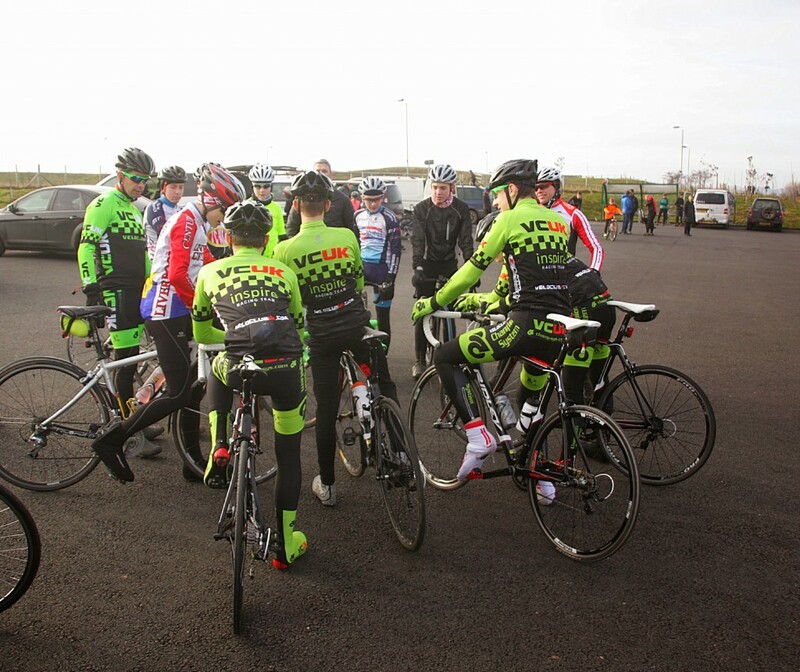 This event was an open event meaning ‘open to anyone’, and over 100 riders had entered the time trial in advance. On Saturday the weather was still good but the wind had picked up and that was the most significant difference from Wednesday. Lewis rode the same bike but was still very determined to ride fast, and ambitious to go faster still. He managed to record a time of 22:38, gaining a new PB. 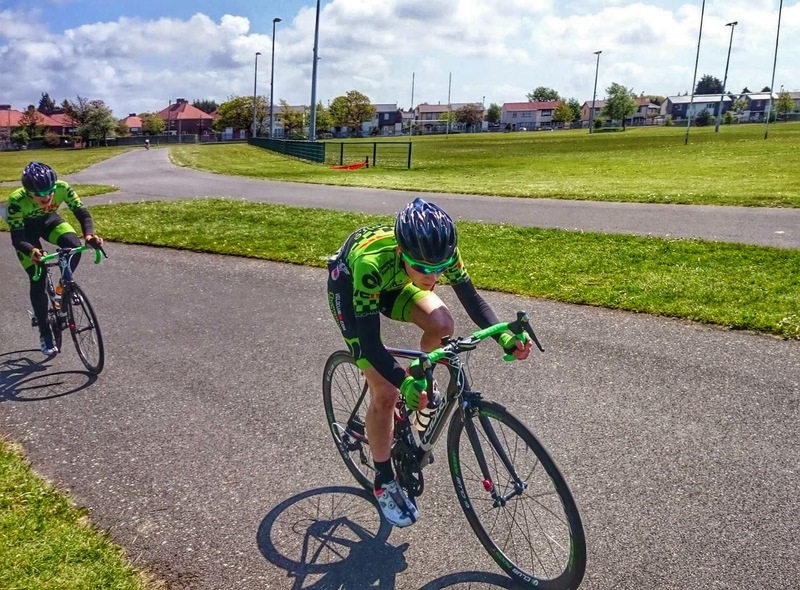 Luke and Halley travelled over to Scunthorpe to take on the third round of the National Youth Omnium series in very windy conditions on the near 500 metre open air velodrome. 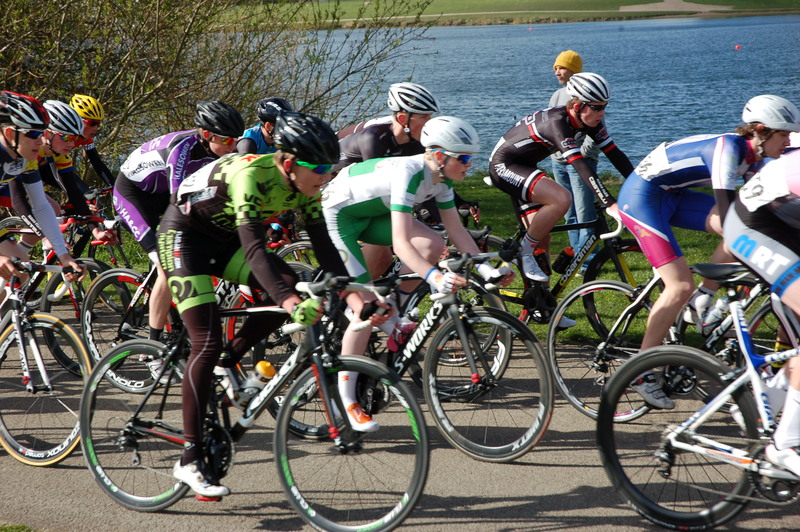 The weather was kind with clear skies allowing a day of uninterrupted racing. 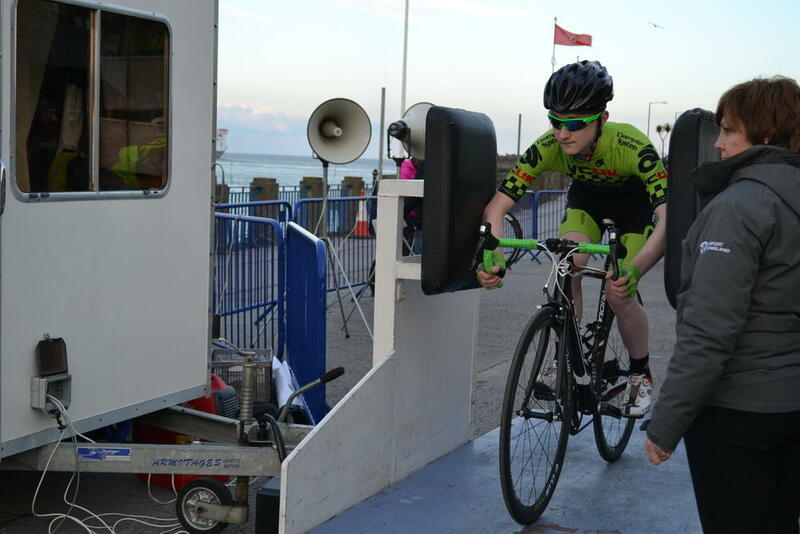 The organisers had elected to change the running order, putting the Youth A riders on first to try and give them an early finish as a number of the second year riders had exams the following day, meaning a mad dash to get ready for the first event, the 2 lap Time Trial. 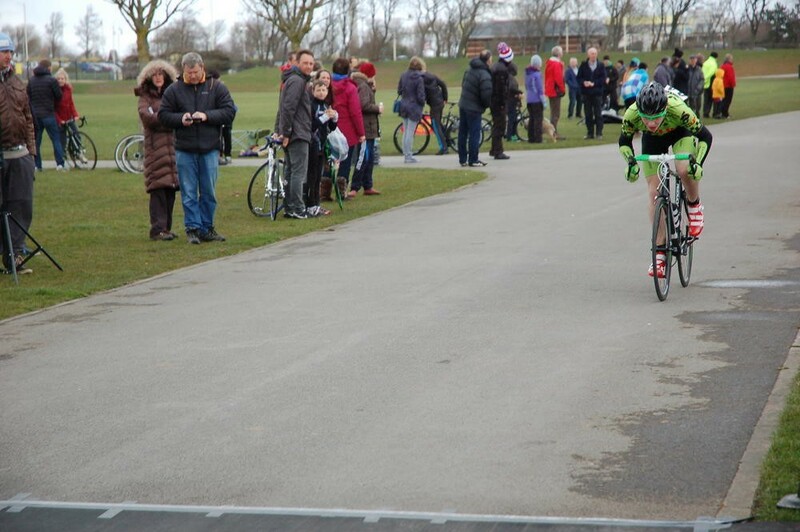 Luke was off in the second heat and struggled to get up to speed after starting in a raging headwind. Halley was in the last heat and fared better. 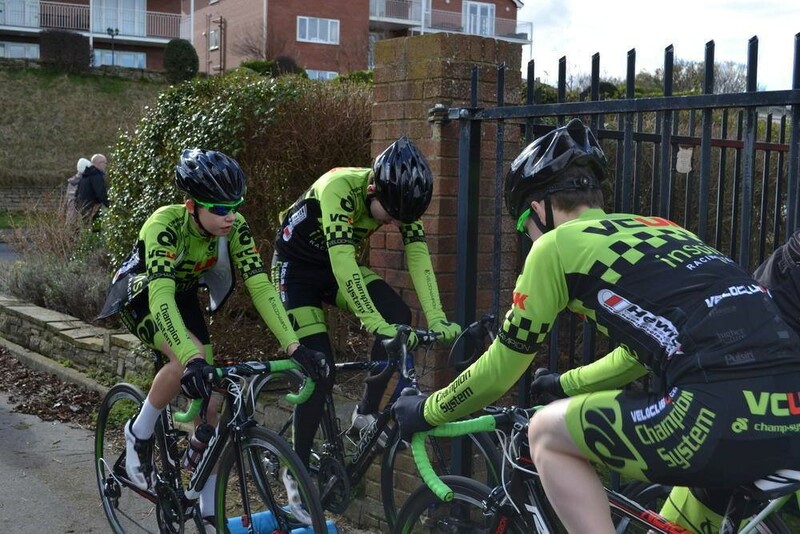 On Friday the 1st May, the boys took a day off school in order to get to the Isle of Man to participate in the National Youth Circuit Stage Race, held over the bank holiday weekend. Seventy of the best riders from across the UK are entered in the event, making for a tough weekend, especially for those riders in their first year of racing in this category.nThey arrived at Liverpool docks to board the Steam Packet Ferry on Friday morning with great weather and arrived on the island mid-afternoon. 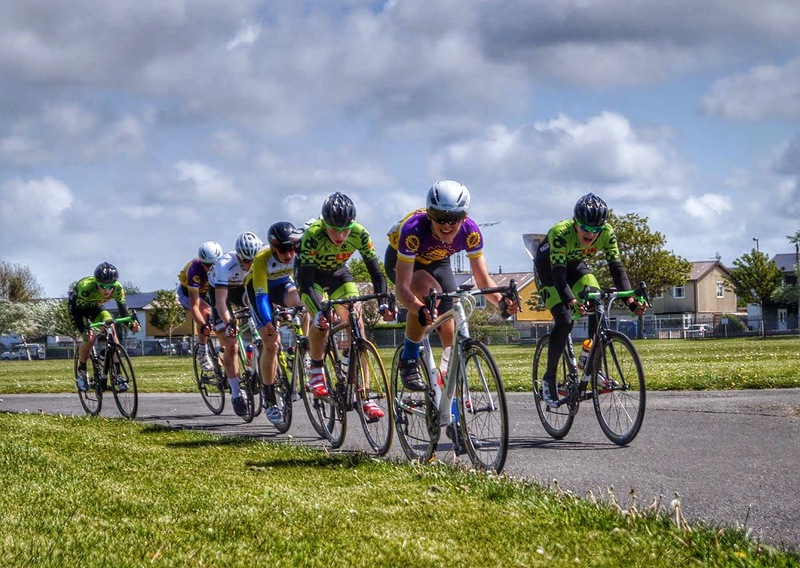 On Saturday the lads travelled up to Ellerslie for the 36.2km (5 lap) road race that includes a particularly tough climb and very fast descent. The team woke up to some horrendous weather conditions, with early morning temperatures at only 2 degrees. With the race not due to start until late afternoon everyone was hopeful of some drier spells. Unfortunately, the rain continued to pour all day long! 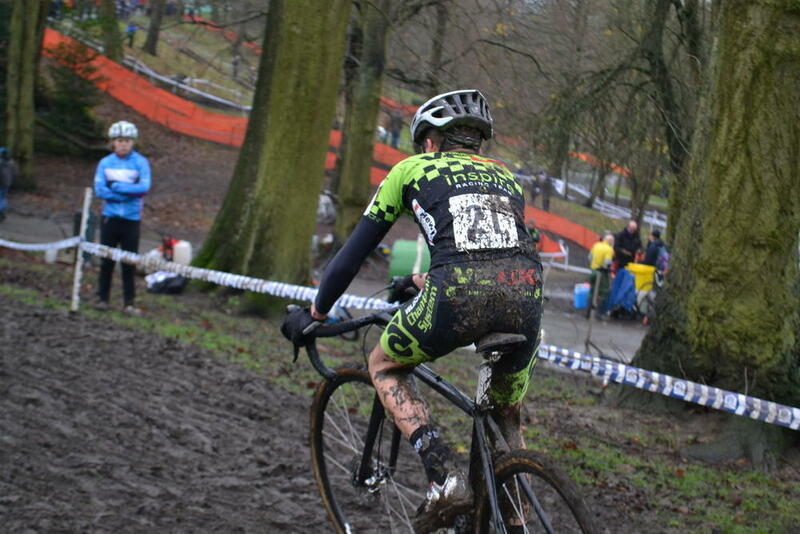 Owing to the conditions, the race was cut short (to 3 laps) even before the riders took to the line. This was a wise decision considering that many of the junior riders had experienced symptoms of hypothermia in the mornings racing at Peel. 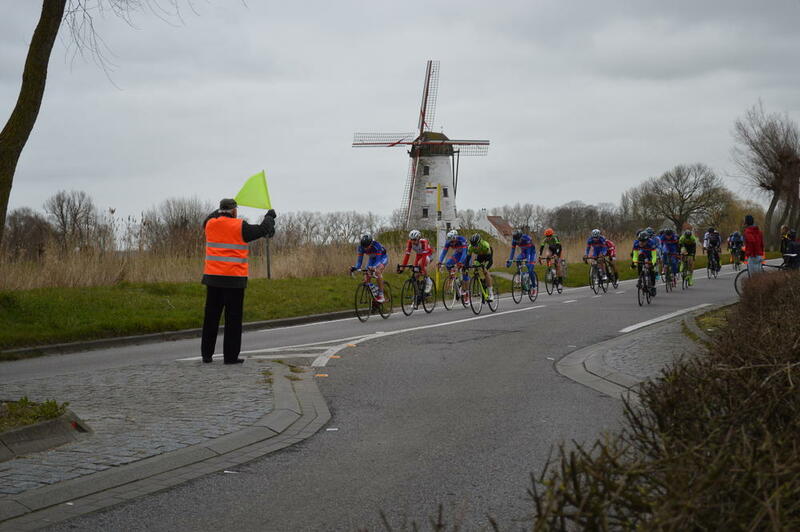 The race started fast with the bunch splitting immediately due to the climb and the wind. The race was consistently fast throughout all the uphill and downhill sections with the leading riders trying to put as much time into the others as they could. By the time the lead group began the climb for the fourth time, there was only a handful of contenders left who battled it out for the podium positions. 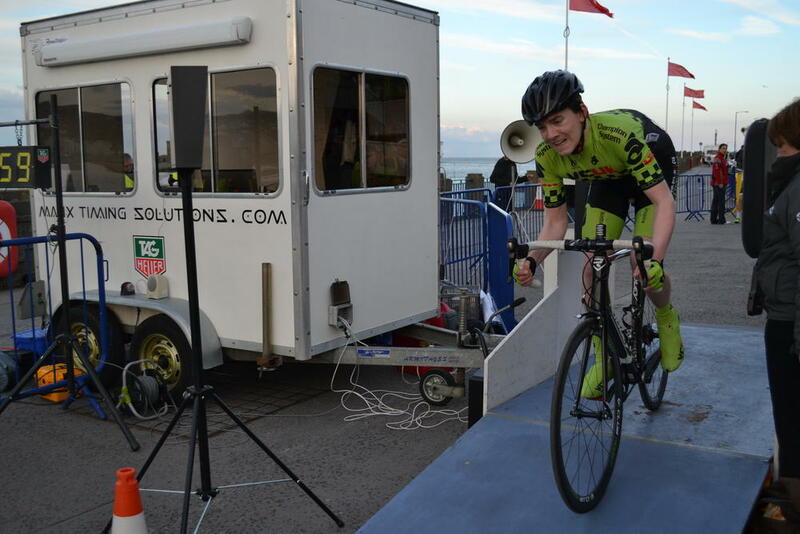 It was the notorious Daniel Tullett who managed to take the stage win, ahead of Connor Davies and Fred Wright. 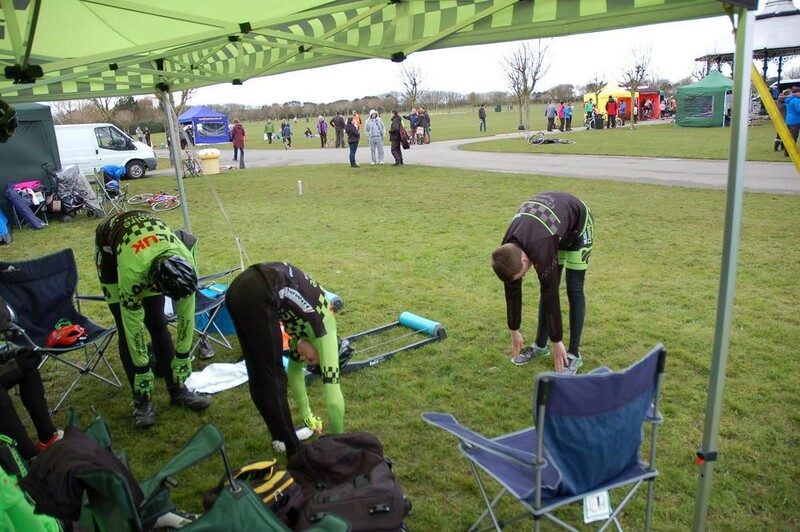 The riders managed to complete the race safely, further down the field and were just grateful to cross the line and get back to the race HQ for hot drinks and warm clothes. 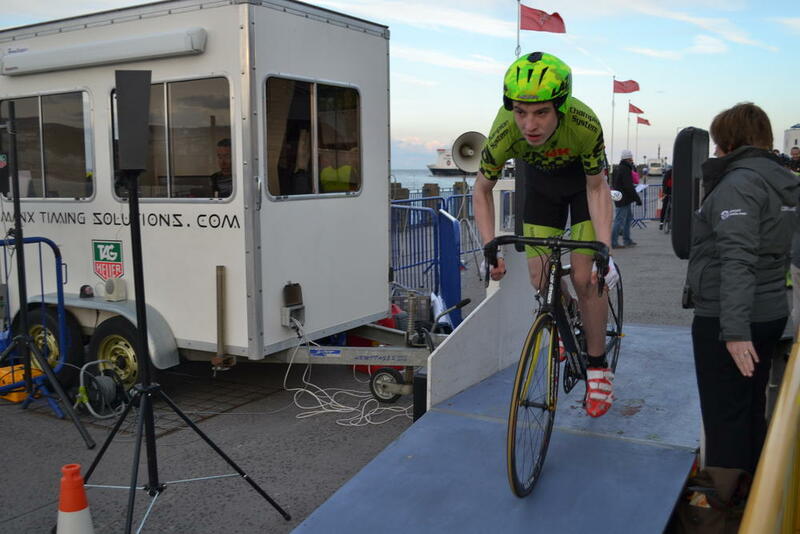 On Sunday, the 3rd and final stage of this year’s tour took place on the promenade at Ramsey. Unfortunately Lewis was forced to take a decision to retire before the stage due to his persistent knee discomfort. However on a more positive note the rain cleared up and the sun came out to shine by the time the race started in the late afternoon. The course at Ramsey is around 2km straight up and down the prom. However it’s made difficult by a strong headwind on the way back in and tight hairpin bends at each end. Halley finished the race 45th with Luke and Dan just a little further back. Our riders were left to reflect on a race that was much harder for them than it needed to be due to early positioning. 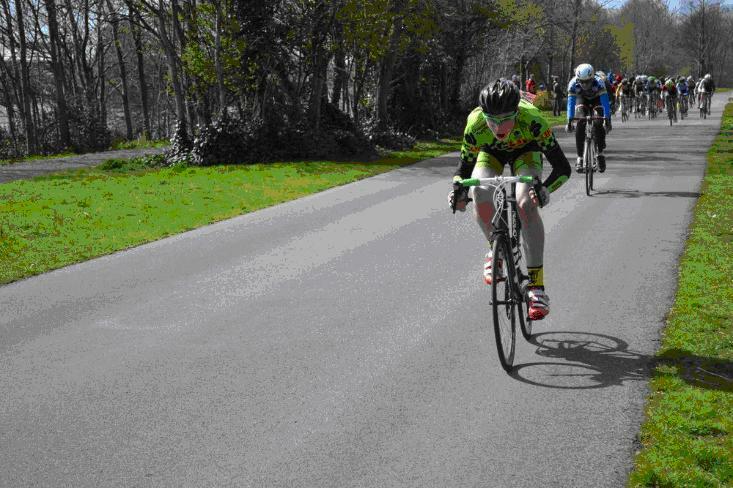 The stage was won by Fred Wright of VC Londres who also narrowly snatched GC victory from Dan Tullett and Rhys Briton. 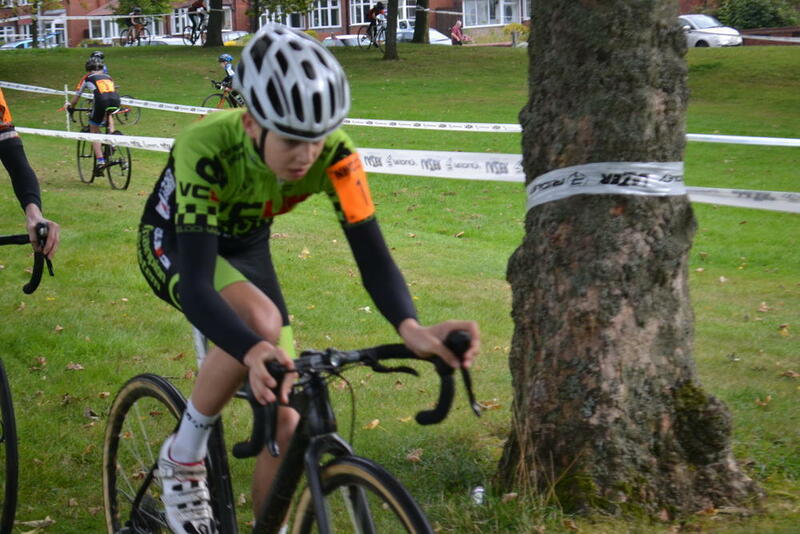 The boys took part in the recent North West Youth Circuit Championships in Southport and team rider, Dan Gibson was asked to write a short report of his experiences. “The race started out like every race does, fast and dangerous with people taking risks on every corner just to move up one place in the lead group and after a few Laps the inevitable happened. There was a crash on the chicane just after the finishing line but thankfully none of our riders came down but Lewis was badly held up by it. 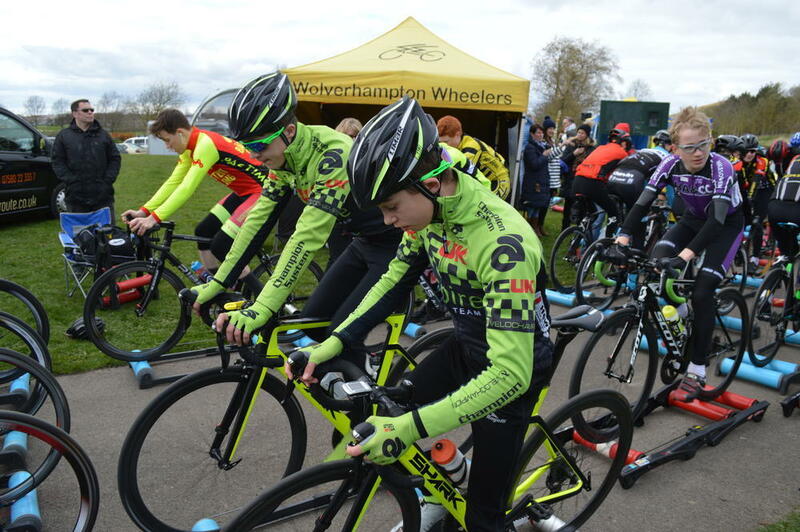 Last weekend, three of the Inspire VCUK riders had a track focussed weekend as they competed in the annual British Cycling Omnium Northern qualification contest. 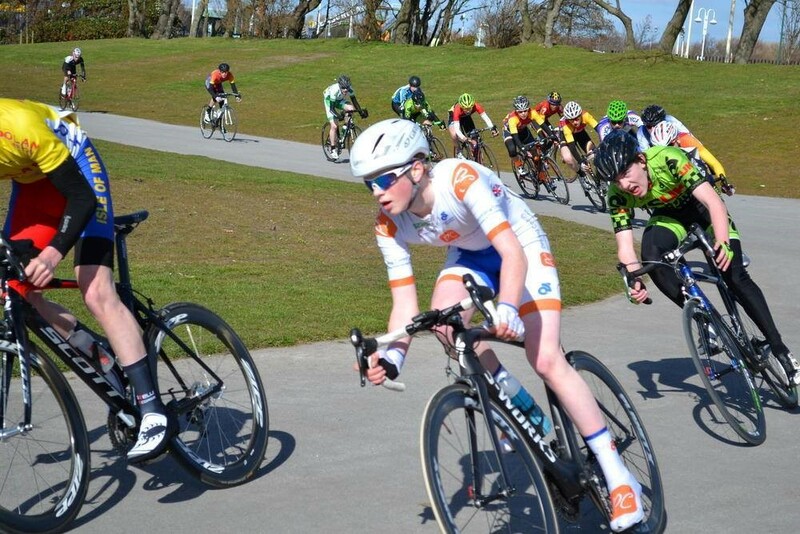 On Saturday the 9th May the team (minus Lewis) rode in the Knowsley Youth Omnium which consists of five different track events: time trial, scratch, devil, keirin and points races. First up was a 1 lap time trial, in windy conditions on an outdoor velodrome. 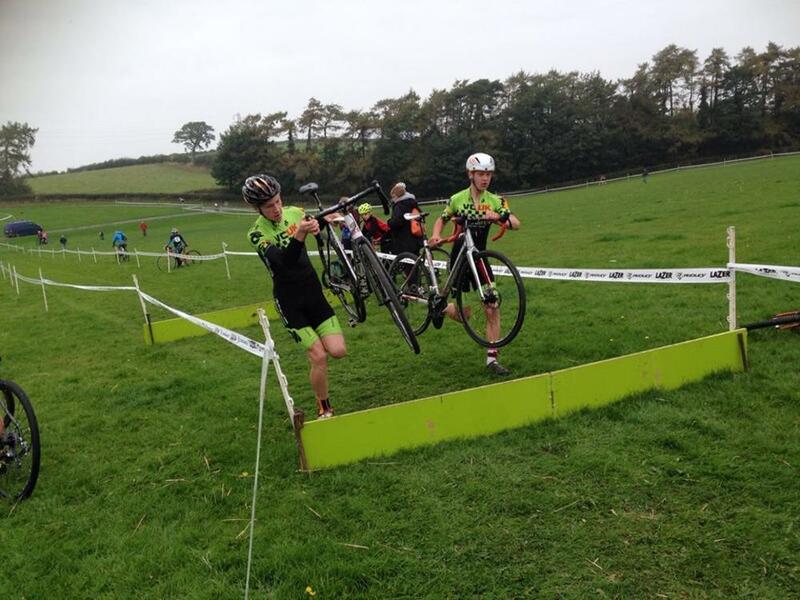 Daniel Gibson and Luke Cheetham finished 26th and 28th respectively, whilst Halley was unfortunate to pull his foot out of his pedal to roll home at the very back of the field. The second race was the scratch race, all our riders animated the race and finished in the bunch along with a lot of high calibre riders. Next was the devil, and by far the most dangerous race with a few people in the bunch not looking before changing their line, or trying to get through gaps that just were not there! The last race of the day was the points and with nothing to lose, Daniel attacked with a lap to go, giving it everything, but was caught on the back straight by the chasing pack. 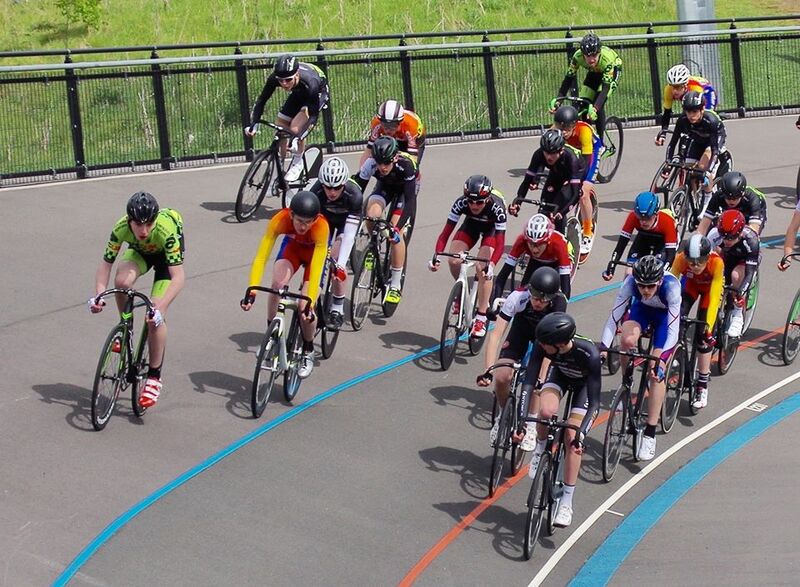 On Sunday the 10th May, the same lads travelled over to the National Cycling Centre Velodrome in Manchester for round two of three. The format was the same as the day before with each rider competing in five events. 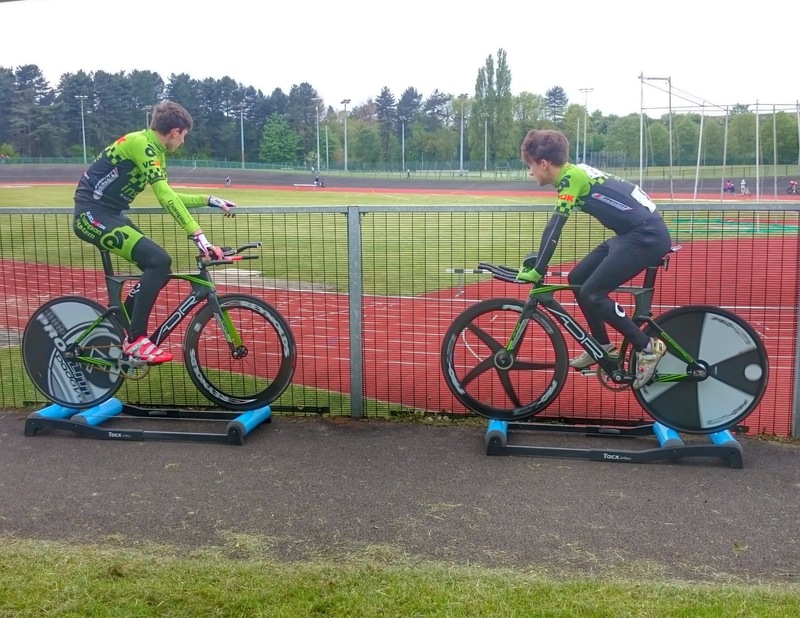 Being indoors, the time trial was not affected by weather and the lads were used to racing on the boards. 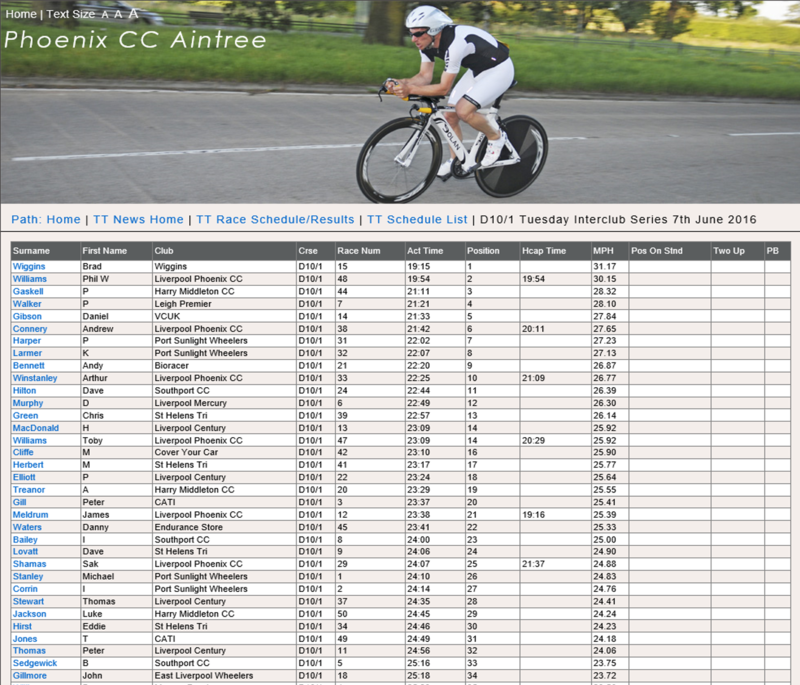 In the 1km TT, the boys had similar results to Day 1 with Halley finishing in 22nd place, with Daniel and Luke not far behind (mid to latter half of field). In the remaining races, Halley showed he had more to give with two top 10 placings in the scratch and points races with only his TT really setting him back to 21st overall (mid-field score). Daniel and Luke both consistently finished inside the top 20 for the remaining races with only their TT’s really hampering their overall result. 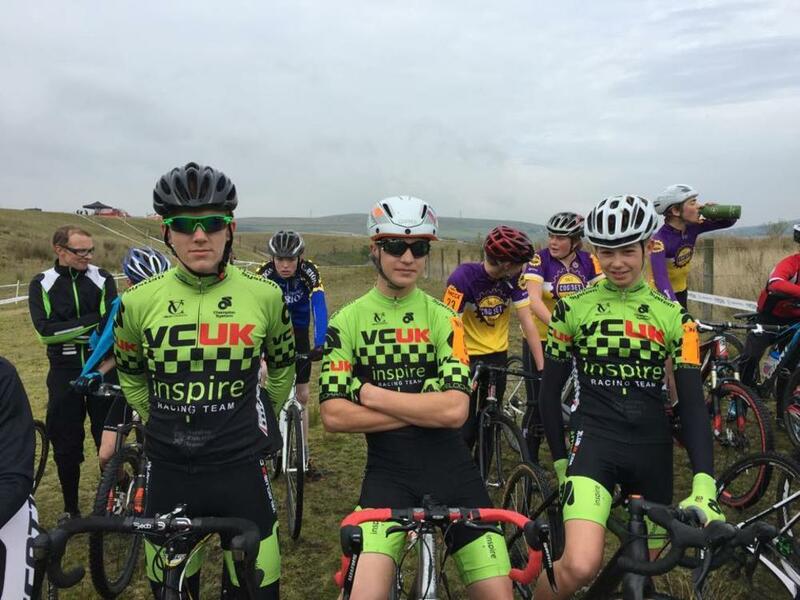 This weekend, the Inspire VCUK Race Team travelled up to Hetton, in the North East, for the first race of the BC National Circuit Series. “The race was 33 laps of a long and twisty circuit consisting of a small climb and descent before an uphill sprint. 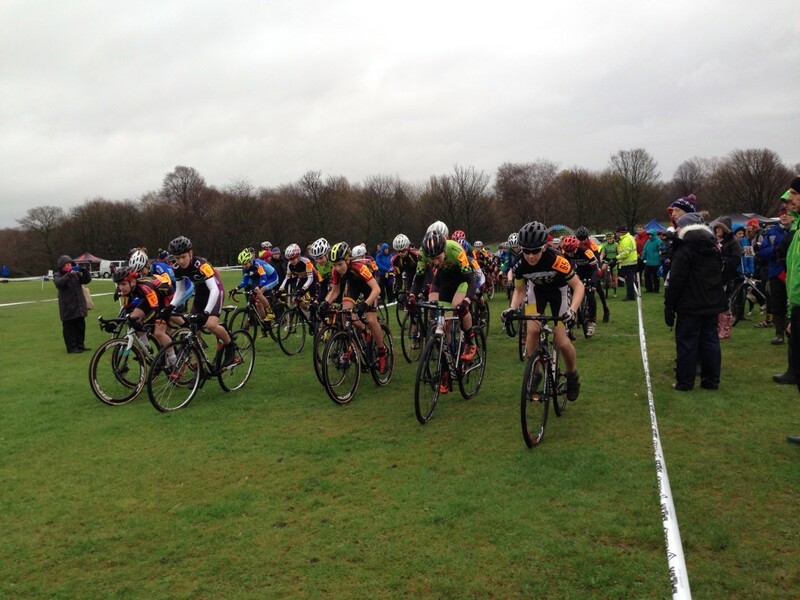 There was a field of 80 high quality riders competing in the Youth A Race. The race started fast. It was a tight bunch with everybody trying to stay close to the front. Throughout the race lots of riders were getting dropped due to the high pace and longer distance. A few attacks went off the front but all were reeled back in until with around 10 laps to go an attack went that would stick. The riders in this final attack stayed away for the remainder of the race with the bunch being too slow to react with their chasing. 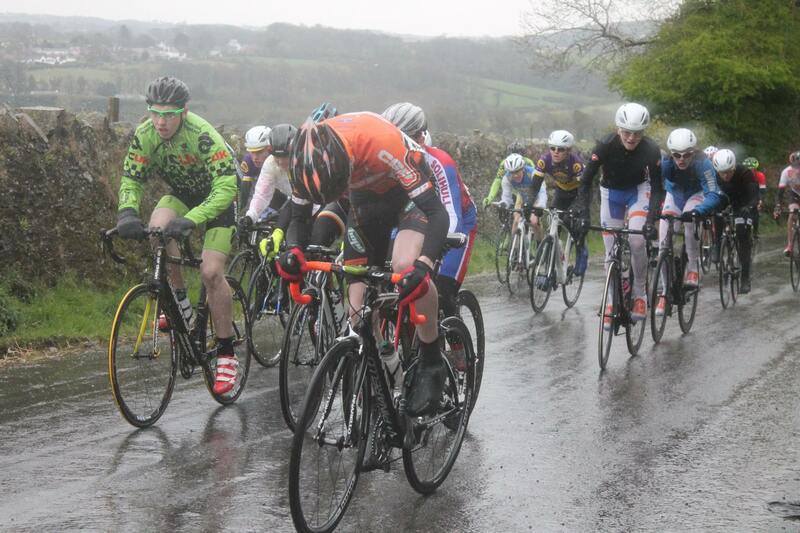 Unfortunately there was a bad crash during the bunch sprint that brought down two Inspire VCUK riders. However all the riders in the crash were ok with only collateral damage enabling them to cross the line and finish the race. 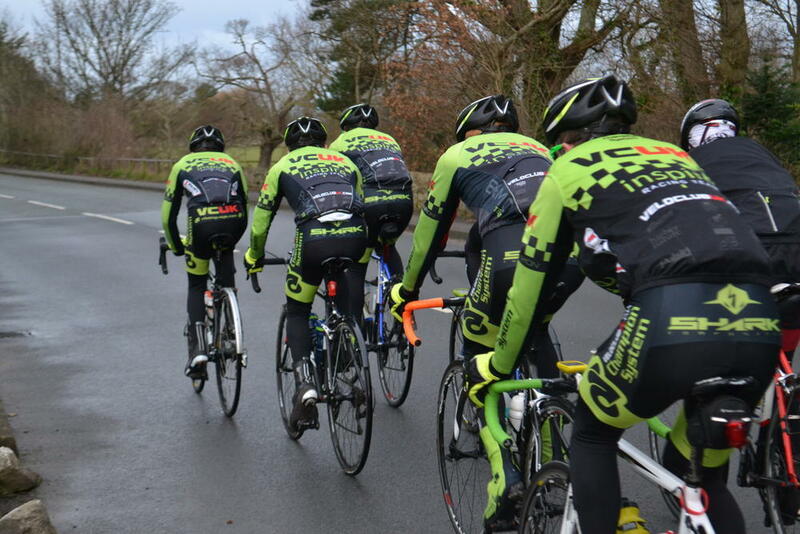 The Inspire VCUK Racing Team held their second youth training camp of the season, this time North of Lancaster. 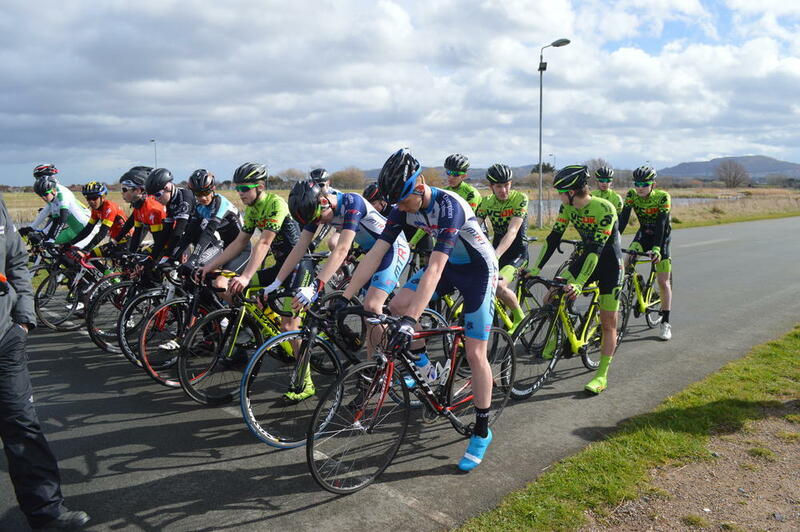 The camp began on the Saturday morning at the Salt Ayre Closed Road Circuit, where the riders took to the grid for the first round of the North West Youth League circuit race series. The league is held over several rounds through the season at various NW circuits. Each round contests 2 races: a short sprinter race and a longer endurance race. The first race was 4 laps, so almost over with the blink of an eye. This race was won by Alistair Leivers of BYCA, with Jim Brown in 2nd place and Will King 3rd. Luke and Halley both managed a top 10 (7th & 9th) and Lewis just behind in 14th. For the second race over 18 laps, the boys all looked good in the bunch and all attempted to move up to the front of the race. Halley made a good attempt to break away but was later reeled in by the pack and, on the final lap; Luke attacked at the bell for a brave attempt at a solo win but was caught by the time the riders appeared from the trees. 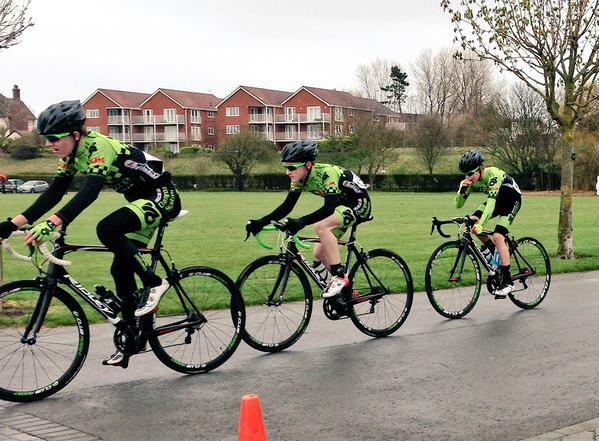 In the end, the race was won by Yorkshire rider Jim Brown with all our boys finishing comfortably in the bunch. 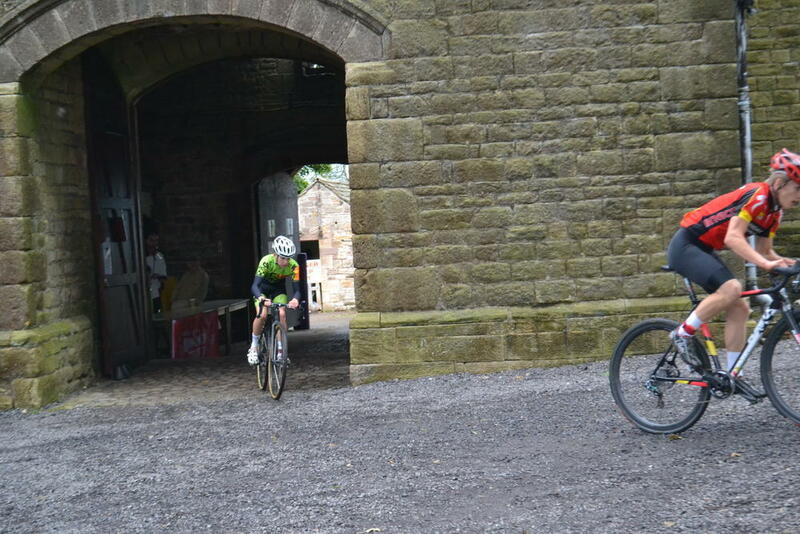 After the race, the boys packed their overnight kit into some weekend support vehicles and then rode from Lancaster to Yealand Conyers (15 mile) via Morecambe and Carnforth. 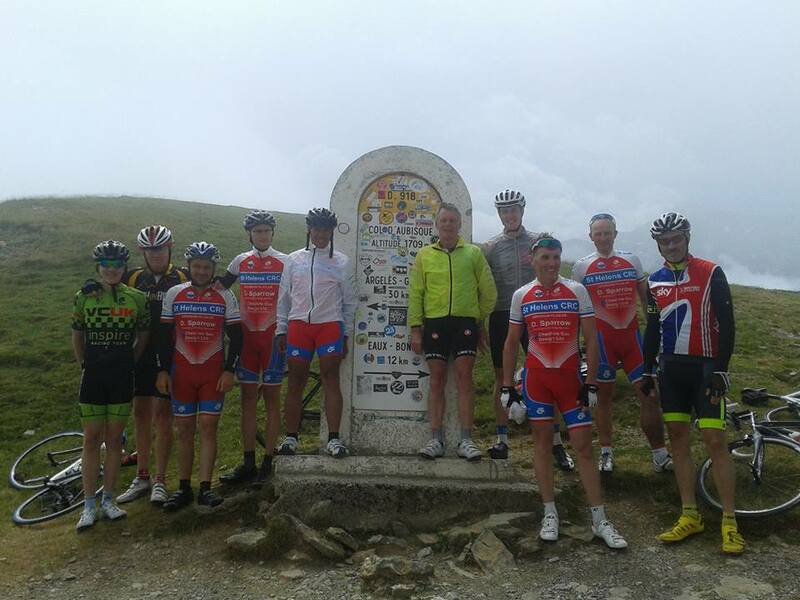 For the overnight stay our riders were joined by a team from Salt Ayre Cogset and a team from Furness Flyers. 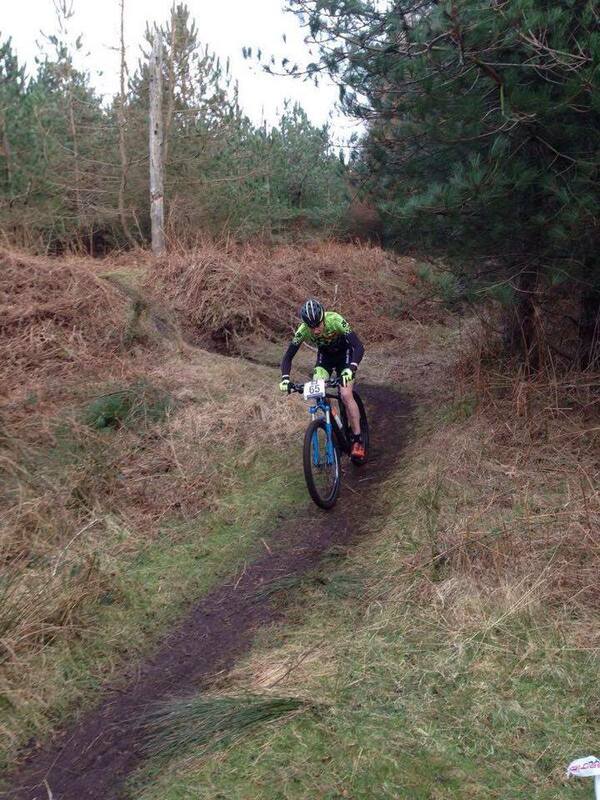 Jordan Stansworth from the Achieve Cycling Team also joined up for the weekend. A great bunch of lads! On arrival at the hostel, the riders first prepared sleeping arrangements and organised their kit for the evening ahead and for a long ride on Sunday. After this it was dinner duties with the riders cooking their own dinner consisting of chicken with pasta in an Italian sauce, followed by rice pudding. The riders hydrated with Love Beets Juice during dinner. After dinner, the riders were handed over to Jennifer Lace for a 1 hour workshop before settling down to watch an inspirational movie to end the evening. In the morning they awoke to rain pelting the roads outside and unfortunately the weather forecast was very accurate! Breakfast was prepared in the morning with help from the riders and comprised beans/toast, porridge, bananas with everyone feeling a little tentative about the ride ahead. A short brief was delivered to the riders at 8:50 and they left the digs at 9am in the pouring rain, heading out towards not so “Sunny Bank” near Capernwray. The original plan was to ride around 70 miles to Ingleton, Hawes, Sedbergh, before returning over Barbon Fells to Kirby Lonsdale and then Yealand. With the weather as it was, there was no way this ride could proceed as planned. The outside temperature was 4 degrees and riders were getting soaked to the skin very quickly. 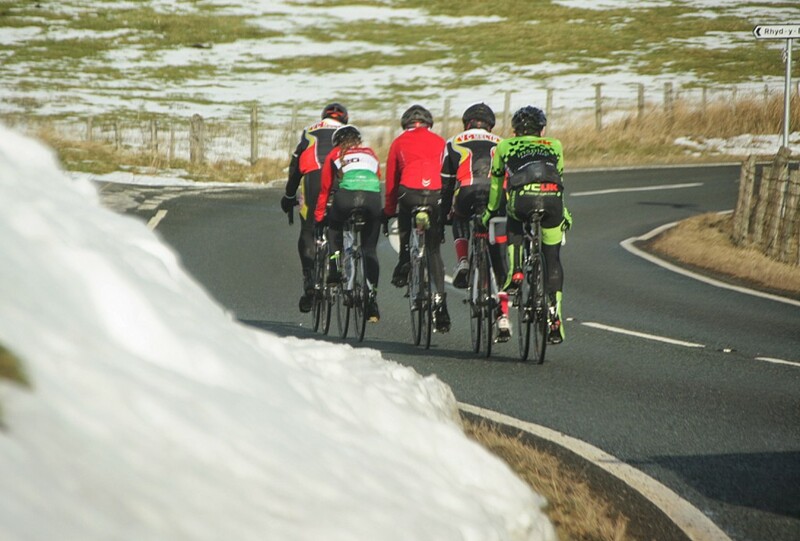 By the time they reach Ingleton it had already been decided to cut the ride short and the route was diverted back to Kirby, with some riders already opting to hitch a lift in the support vehicle as they could not feel their fingers. At the finish Luke and Dan showed a lot of character to carry on and finish the route back to Yealand, along with Sam, Elliot, Chris and Jordan. At the same time, the riders that did climb in the car had no choice – it would have been daft for them to carry on and risk hypothermia! 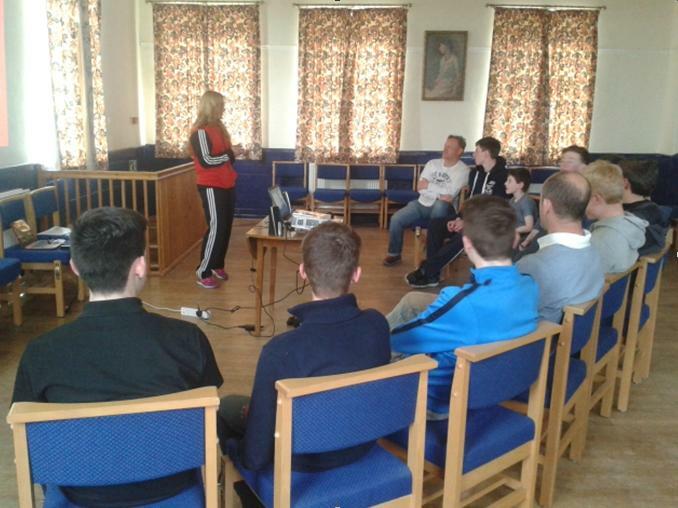 A great weekend was had by all that included elements of racing, training, team building, education and relaxation. 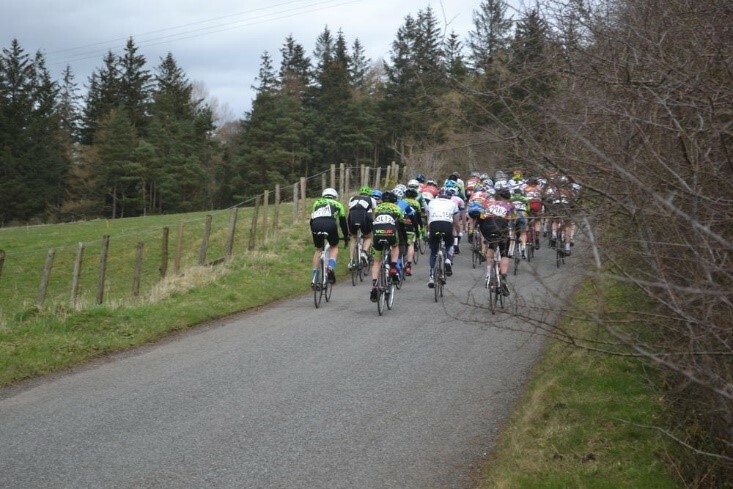 Early April and the Inspire VCUK Racing Team travelled north of the border for the annual Youth Tour of Scotland stage race. 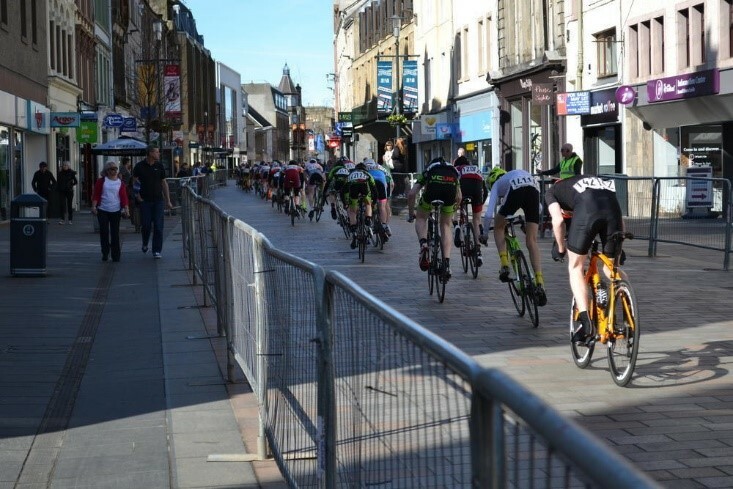 The event is held over 3 days using a mixture of closed countryside roads and a superb city centre circuit in the centre of Perth. Stage 1 on Saturday afternoon, was a 9 lap road race on closed roads, featuring a KOM climb and a fast rolling and technical descent to the finish. 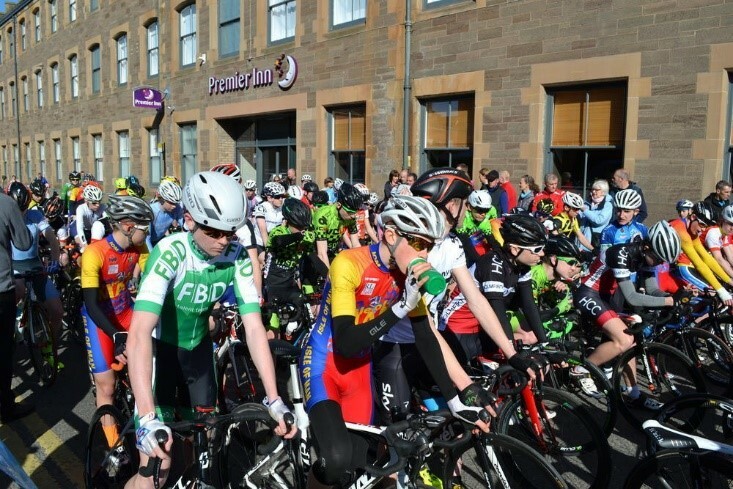 The 60km race was contested by 80 of the best riders from across the UK and also national team from Ireland and a strong contingent from the Isle of Man. The boys rode really well in this race, maintaining good positions in the peloton and managing to stay in the front group from start to finish. As the race gathered pace on the final lap, it was pleasing to see all of our riders still in the lead group and ready to contest the sprint. As the group descended, the pace was hotting up, with Halley leading the charge and Theo Hartley on his wheel! Luke managed to use his technical nouse to finish really strongly in 11th place and Halley finished in mid-twentieth close to our guest rider Matty Taylor with Lewis rolling over the line in 31st position, after narrowly avoided a collision. 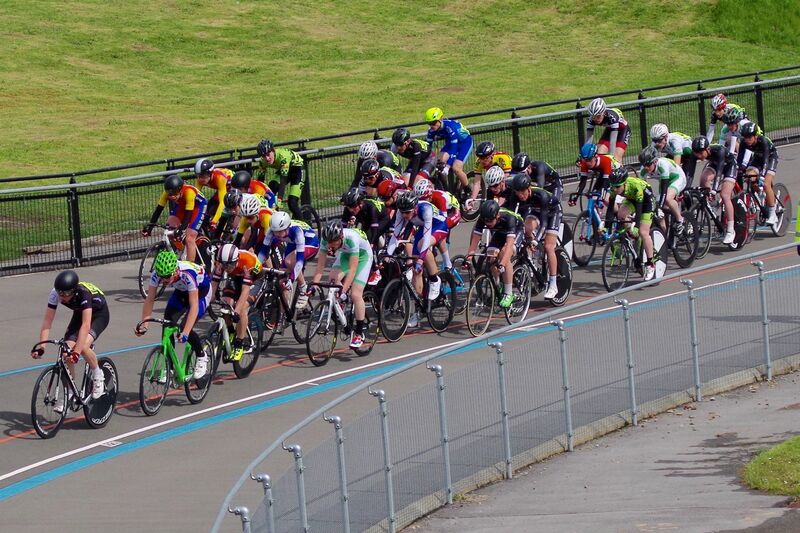 This involved a short journey into nearby Perth City Centre to contest two criteriums. The council had increased its offering from previous years by allowing the circuit to be used all day long on Easter Sunday! The weather was improving hour-by-hour, with bright sunshine, zero wind and probably the warmest spot in the UK. The bunch of eighty riders lining up for the start of the first criterium. The races were run over 40minutes and the first race was very fast. Our riders are learning to deal with this fast and furious style of racing and in particular the need to stay up near the front. This will take time to understand and put into practice and it was evident during the first race that all of our riders were positioned too far back. 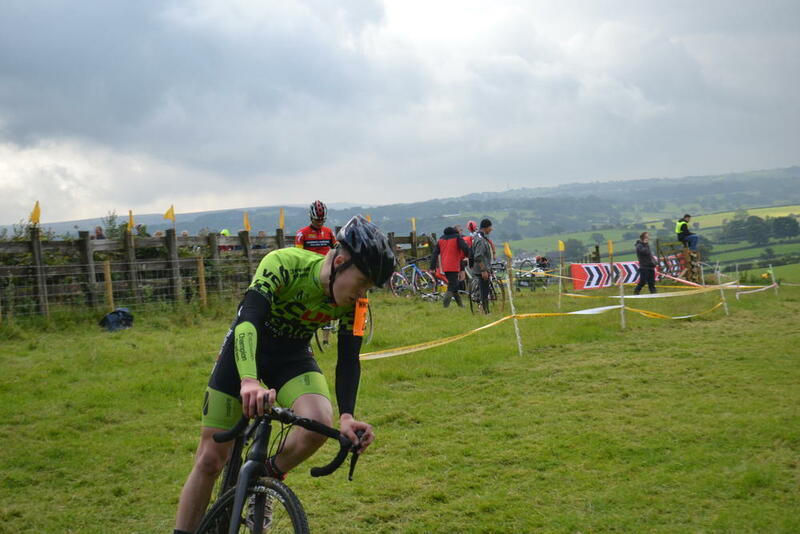 Luke had the strongest start but a minor skirmish caused his chain to jump off and by the time he fixed the problem he was ½ a minute down on the leaders and very disappointed! Later in the race, the intensity became too much for Lewis who is currently experiencing some knee pain when racing/training over longer distances. Lewis was forced to back off a little to avoid aggravating the injury too much before he seeks some specialist treatment. Halley and Matty battled on in the race and finished in the leading group. 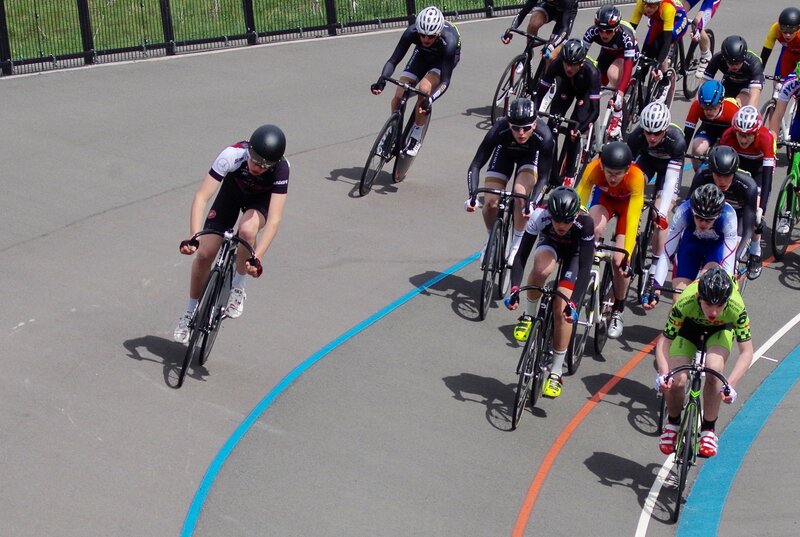 In race 2, Luke again started strongly and was looking really comfortable towards the front of the peloton, keen to make the second race more successful than the outcome of the first. Halley, Matty and Lewis all started well and looked good. After around 30 minutes, Lewis again backed off and rather than making big efforts out of the corners, he chose to use lower gears and spin his legs to save his knee for the next day. Unfortunately, towards the end of the race, after 20 laps, a serious crash occurred on the finish straight with two riders having to be stretchered off the course and taken to A&E. 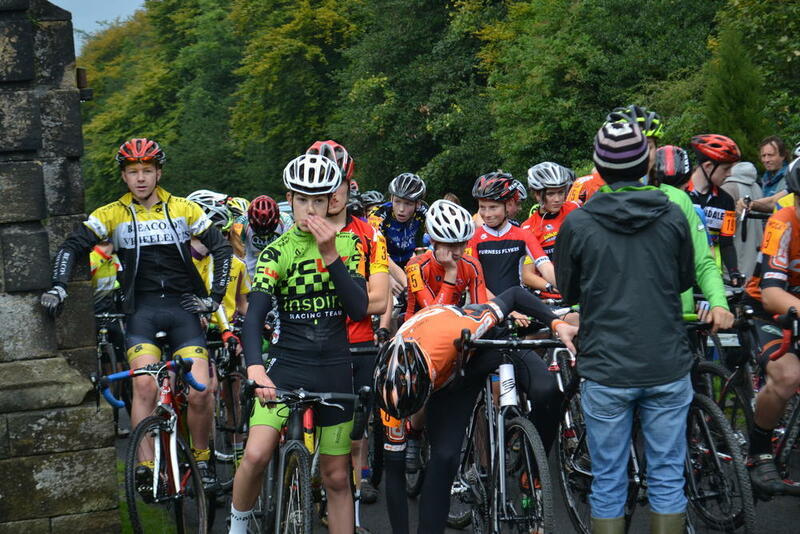 We heard later that both riders had not sustained serious injury and are recovering well but owing to a risk assessment of the course and judgement from the Chief Commissaire, it was decided to abandon the 2nd race. So on to the final stage on Easter Monday, this time close to the HQ – in and around the school grounds. The final stage involved 16 laps of a 2.55km course equalling 40km in total. The course is very technical with elements comparable to the Paris-Roubaix! The course also includes a short but steep climb to the start / finish area which when tackled 16 times becomes pretty hard on the legs! 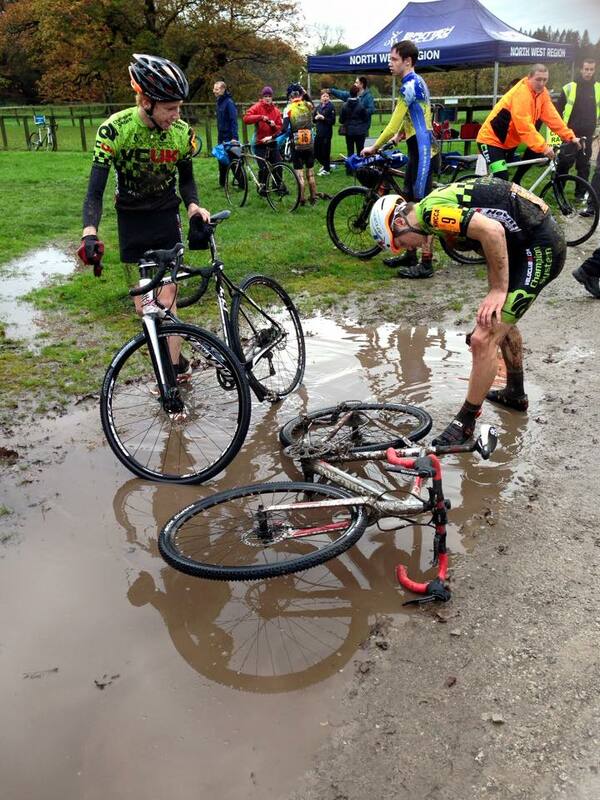 All our riders had different levels of success and misfortune on all the stages. For this stage, Luke got caught behind a crash and found himself at the very back of the bunch as they started the climb. By the top a gap had opened and Luke was unable to stop the elastic snapping, probably following his efforts on Saturday and Sunday. To his credit, he battled on for the rest of the race and never gave up! Shortly after Luke’s misfortune, Matty had a mechanical failure with his electric gears which prevented him from changing into lower gears. This was really bad luck as he had performed so well over all of the previous stages and he reckoned that the final stage was the one that really suited his ability, being a well versed CX rider with good technical ability and good climbing ability. Nearer the front of the race was Halley and Lewis, both hanging on in there as they counted down the laps. 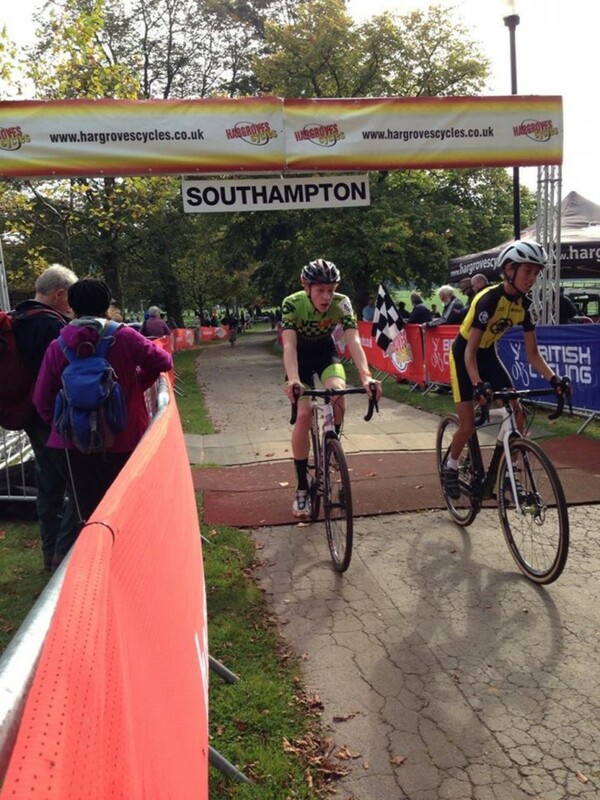 At the finish, Lewis and Halley crossed the line in 33rd and 34th place and in the leading group. The teams positions after the final stage were: Halley 23rd, Lewis 30th, Matty 37th and Luke 46th. 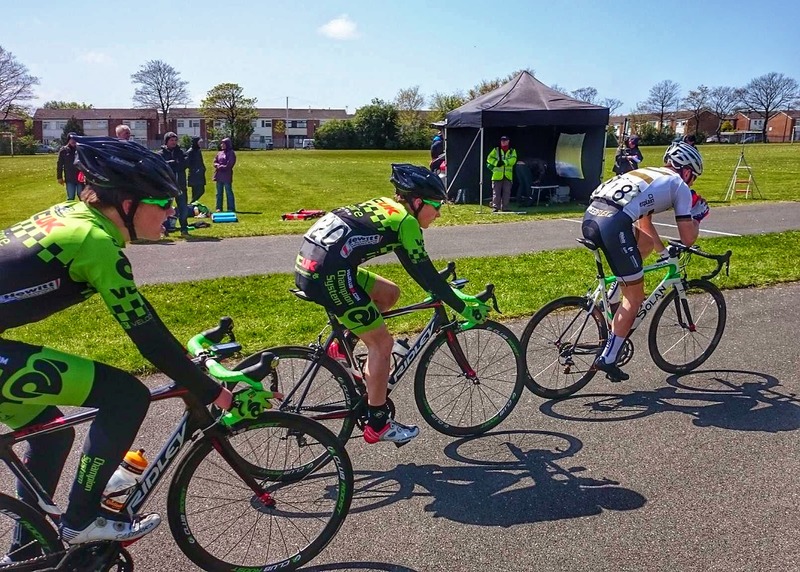 For the third and final round of the Dolan Series, the Inspire VCUK Racing Team had a full complement of riders returning to Southport: Daniel Gibson, Luke Cheetham, Lewis Hartley and Halley Woods. 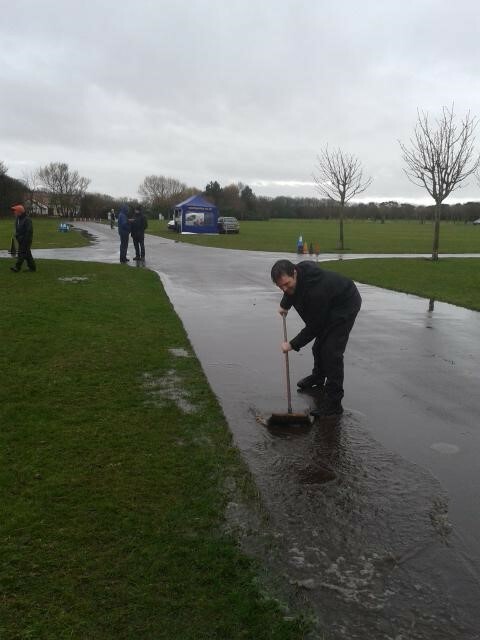 It was that wet that the races were delayed and the course had to be swept to remove a deluge of water on the circuit. The course eventually began drying up with the brisk wind and a single and relatively short race eventually got under way early in the afternoon. 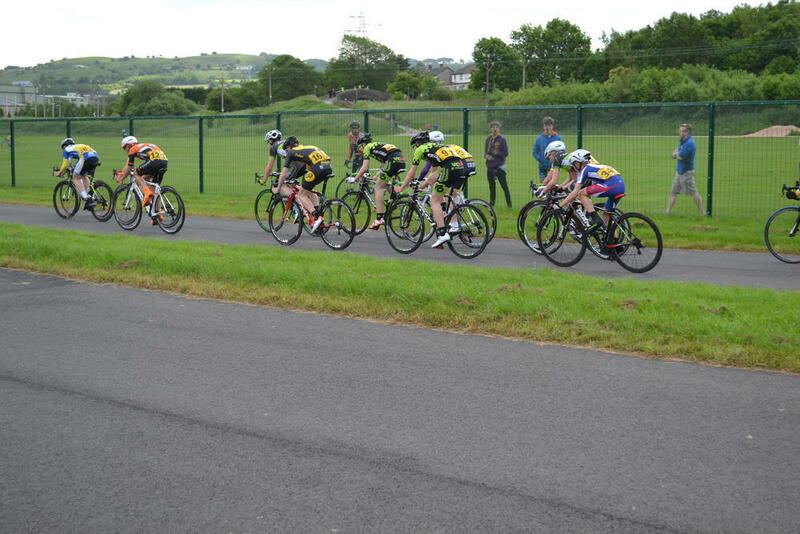 The fifteen lap race set off at the usual frenetic pace with our riders choosing to ride towards the back of the field. On a tight course with lots of corners it is always difficult to move up in a fast race and our riders started to pay the price for their choices. Their race day coach, Jerrod Hartley, was doing his best to encourage the lads to move up but with such a short race and starting at the back, the lads were always going to find this tough. 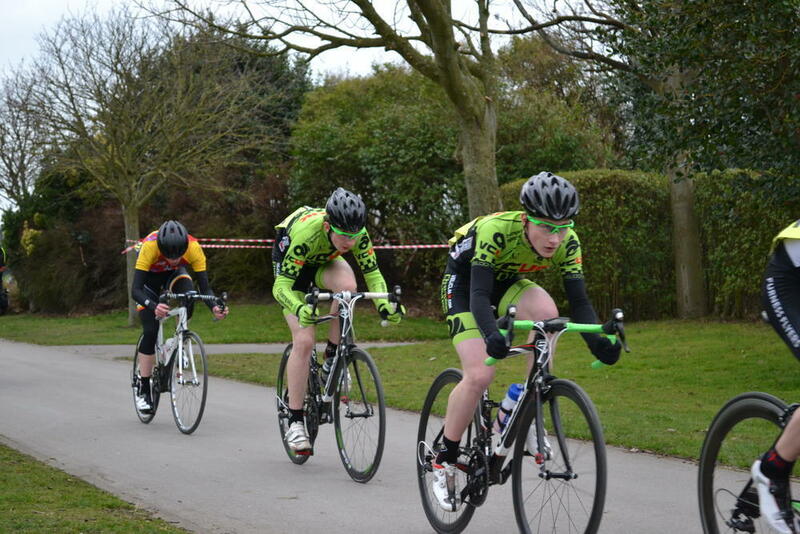 In the final third of the race, Halley, Lewis and Luke had all made progress in getting nearer the front, which was encouraging. In the end, the team ended up with Halley in 8th, Luke 9th, Lewis 13th and Dan a little further back in 19th.The best thing about the day, however, was not the results but other less tangible outcomes such as the fact that the riders left the race in good spirit having had a great day together and also having learned more about bike racing – corning and positioning in the bunch! 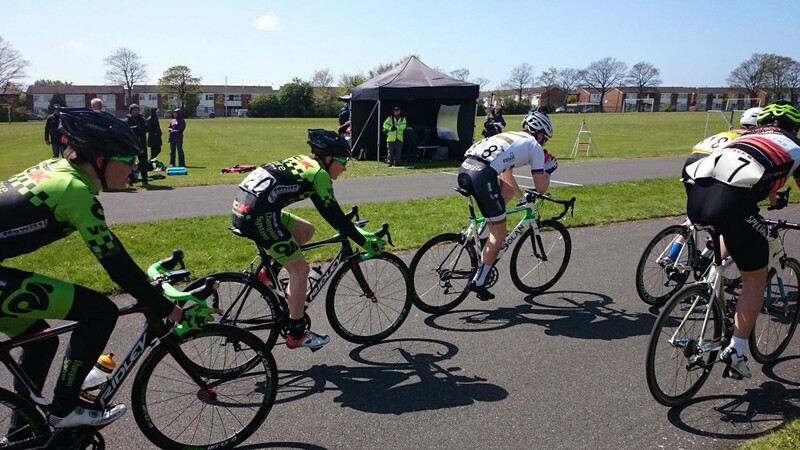 A return to Southport for Round 2 of the Dolan Series for Daniel Gibson, Luke Cheetham and Lewis Hartley and the weather was almost perfect -a touch cold but bright sunshine and not much wind. Race#1: VCUK riders kept in touch at the front of the pack right up to the bell lap but half way round the final lap, on the tightest acute corner, a crash occurred involving a few cyclists. 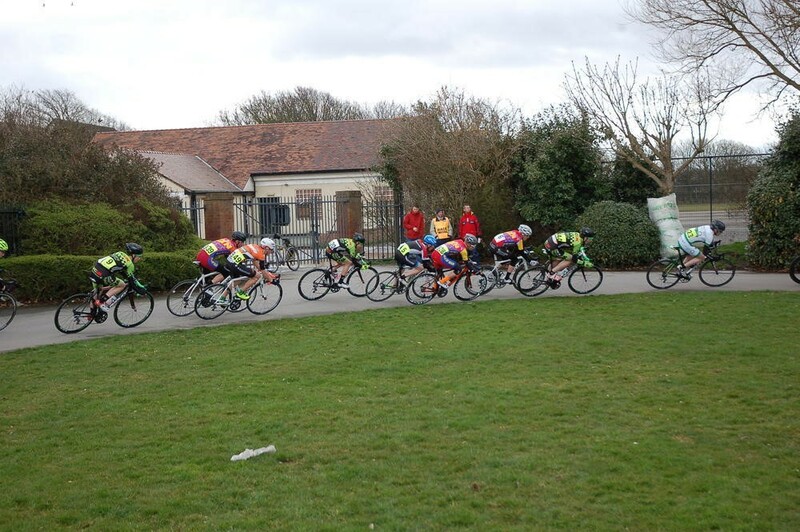 The incident was near the front of the pack and unfortunately all of VCUK riders were held up for the finish, missing out on the opportunity to be placed in the top 10. For Race#2: This was the long race of the day, the boys performed very well. Lewis was always near the front of the bunch, looking for opportunities to break away or policing the strongest riders in the bunch. 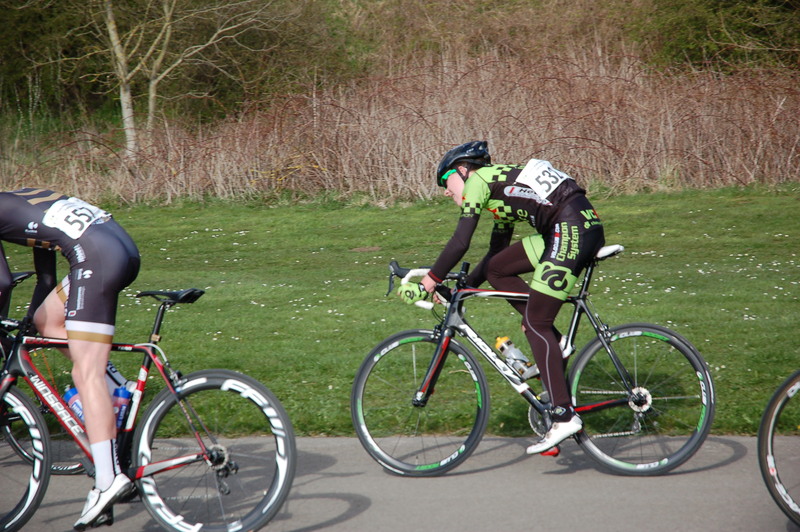 Dan was also very determined to finish with the leaders, expressing a “pain face” throughout the race. 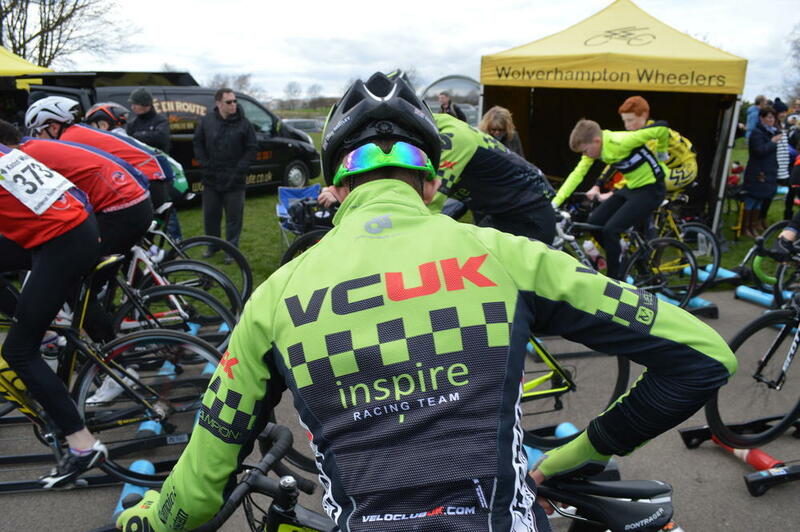 This was the first outing for the Inspire VCUK Racing Team. Although this was an individual event with every rider out for themselves, there was a real sense of excitement and camaraderie among the team. 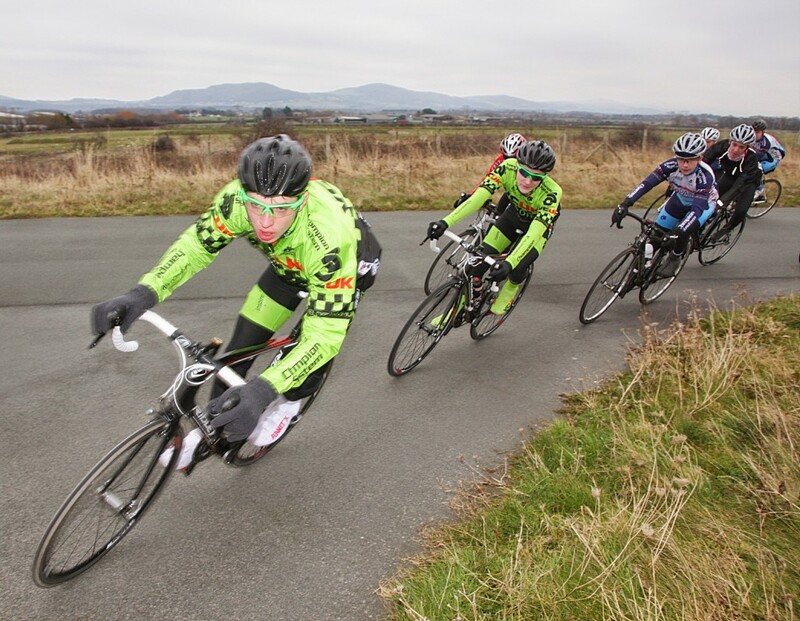 The Dolan Series is a really challenging event and the series is made up of races on three consecutive weekends, starting on 14th March, with each event having a short race of 8 laps and a longer race of 25 laps. 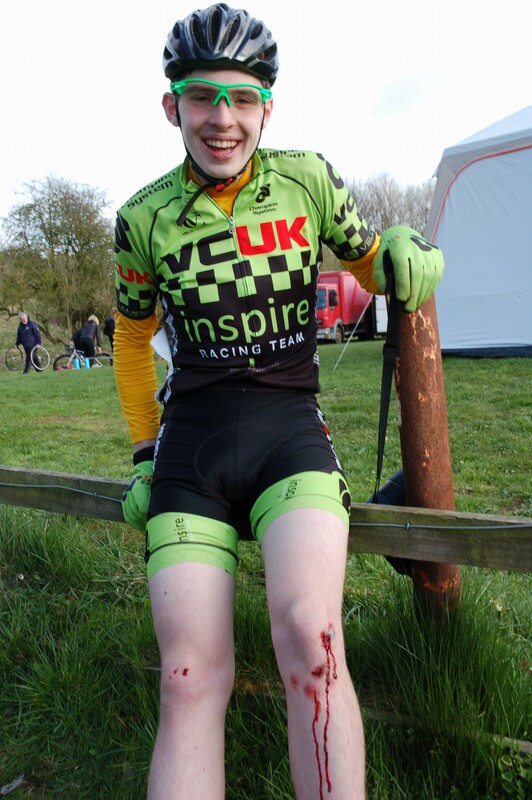 Dan Gibson unluckily came down a few laps in, after a touch of wheels, and suffered some nasty road rash. Thankfully Dan was able to finish and recover for the next race and Lewis, Luke and Halley managed to stay out of trouble. 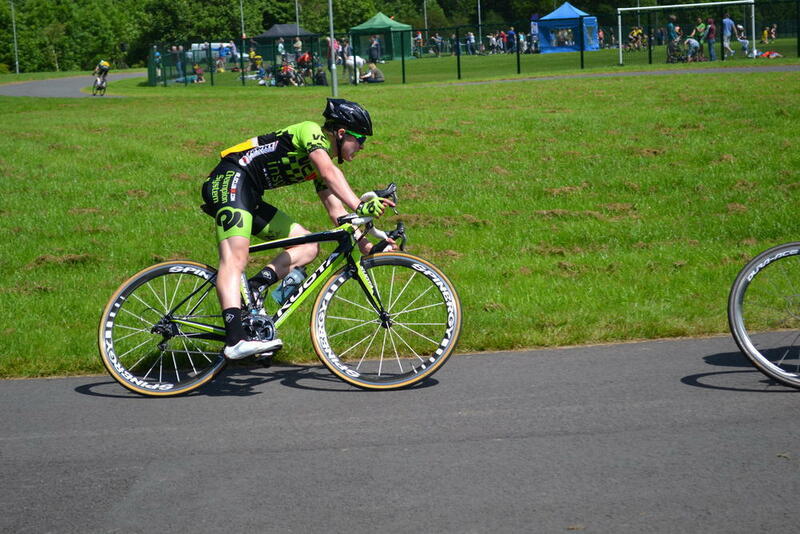 Lewis did particularly well finishing 7th and beating many of the second year ‘A’ riders in a sprint. 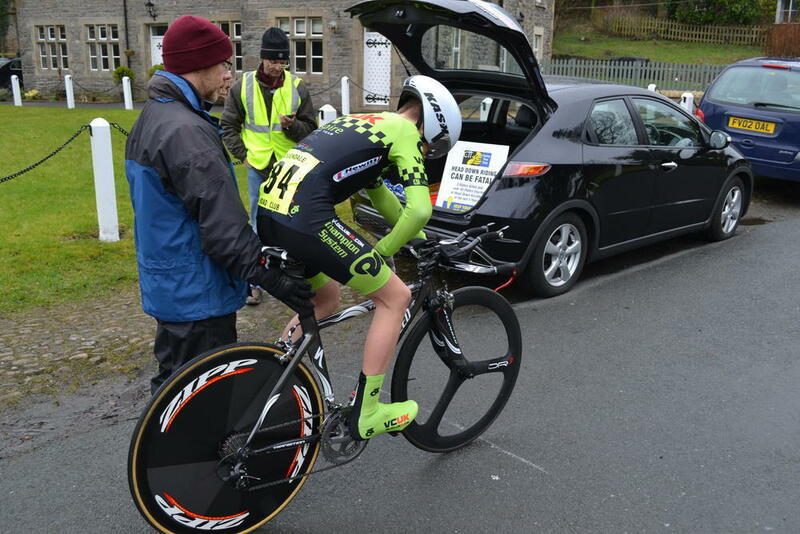 Late February / early March sees the start of the time trial season and as members of the NLTTA (North Lancashire Time Trial Association) the Inspire VCUK team took to the line with Lewis Hartley as their sole rider in the combined clubs 10 mile event. The course was the L105 in Brock and is a loop that encompasses both standard straight road riding with technical twisty Lancashire lanes, often with long stretches exposed to the cross and head winds that anyone who rides around there will be familiar with. 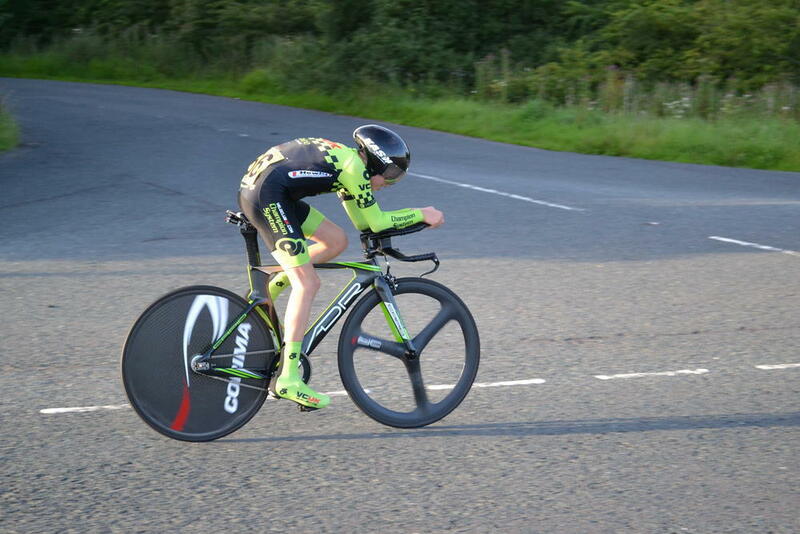 Lewis Hartley competed in the 10.3 mile hilly time trial organised by Rossendale Road Club. The race was based in Bolton-by-Bowland and the first rider was off at 2pm prompt. At this time of the year, when riders are about to embark on another road / time trial season, it is important that riders check that their positions are optimised on their bikes. 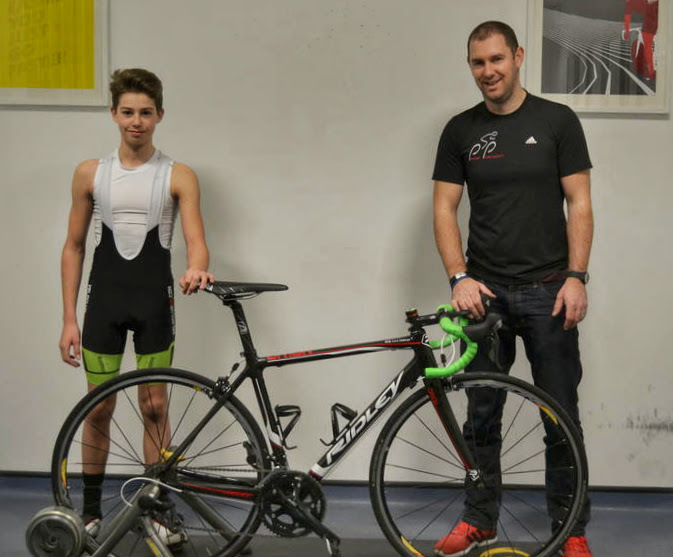 Lewis Hartley travelled to National Cycling Centre (NCC) in Manchester to visit the Inspire VCUK Racing Team’s professional bike fit and cycling injury specialist: Richard Salisbury who operates his business Pedal Precision from within the NCC. 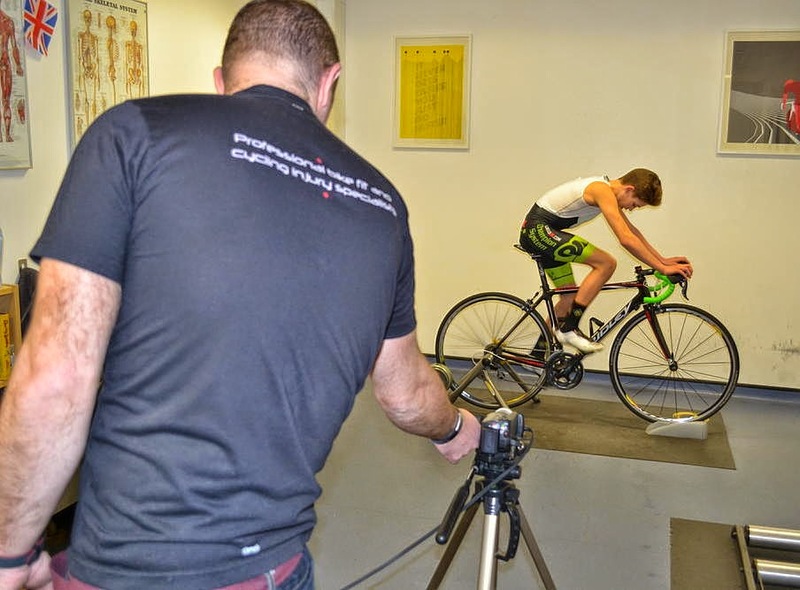 A good bike fit will insure that the rider is in a comfortable posture on the bike so that they can ride in a relaxed position for long periods of time, without developing injuries to the knees or spine. The whole process involves a number of checks including examining a rider’s basic physiology, to understand if a rider has any unusual features such as different leg lengths. Additionally a camera and laptop are used to check positions from various projections to make sure that the rider is comfortable both with saddle height and lay-back through the pedal stroke and also with reach to the handlebars. 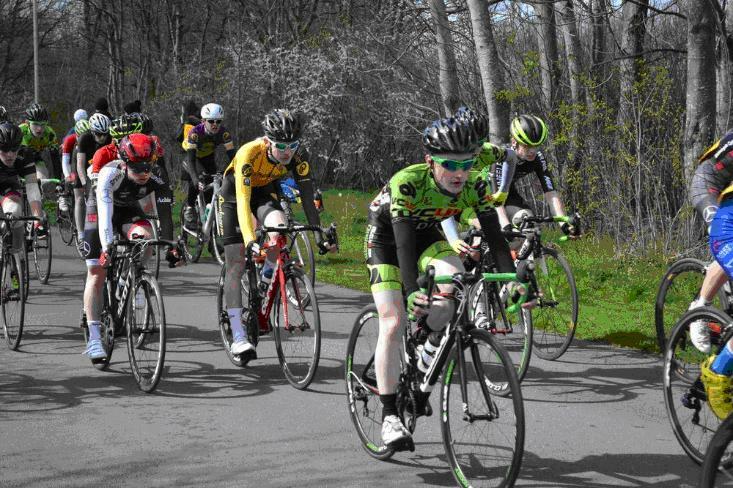 Being a bike rider himself and also being qualified in the field of Sports Injury, Richard is very well placed to deliver this service and as a team, we feel very privileged to have Pedal Precision as a sponsor. The team headed to Rhyl for some pre-season training incorporating a variety of activities. 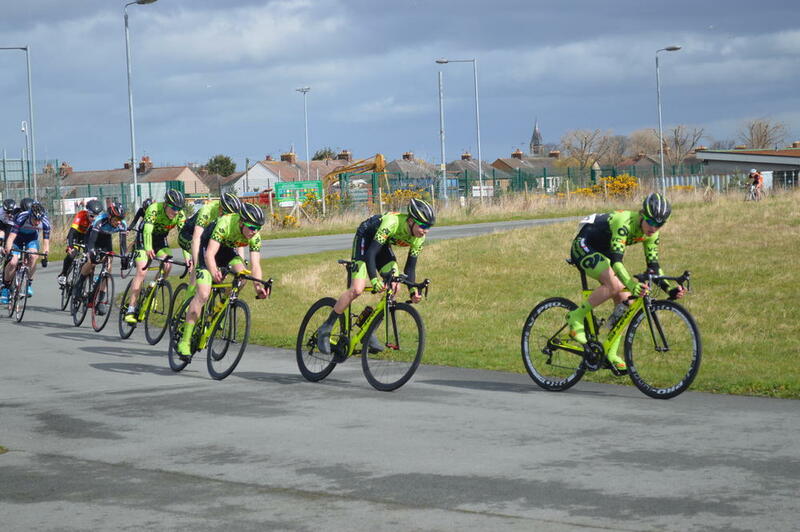 They travelled to North Wales early on the Saturday and began training with a morning road ride of over 60k followed by circuit training to develop skills and tactics in the afternoon. Sunday was a day for heading in to the mountains and after a good breakfast they changed into winter gear to face the fog that was lingering around. This eventually cleared and the sun shone which improved everyone’s mood as they began the biggest climb of the day. There was still plenty of snow at the road side going up to Sportsman Inn and there was some spectacular scenery of Snowdonia. 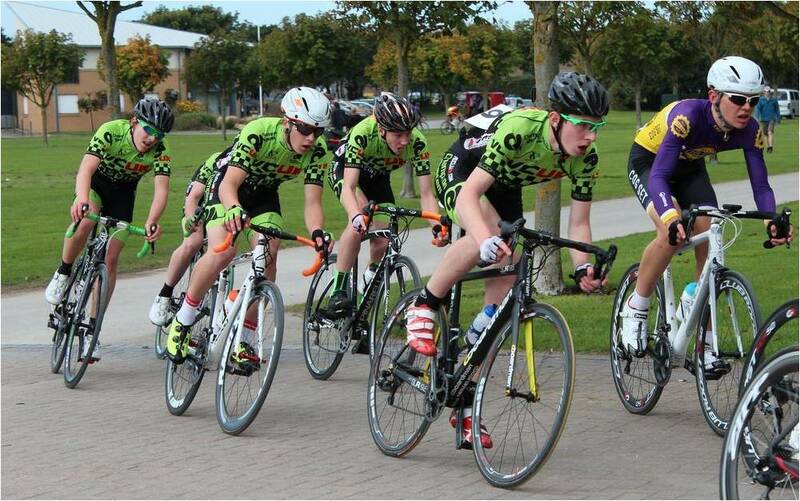 The boys really worked well as a unit and have now started to appreciate the opportunity they have as they start their Youth racing season. 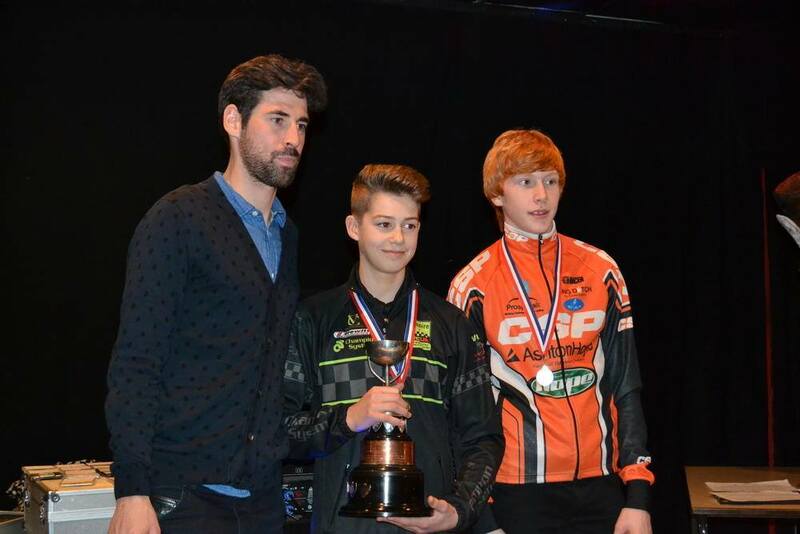 Lewis Hartley attended the NWCCA Prize Presentation Evening for the 2014/2015 Cyclo Cross Season on 23rd January as an age category league winner. 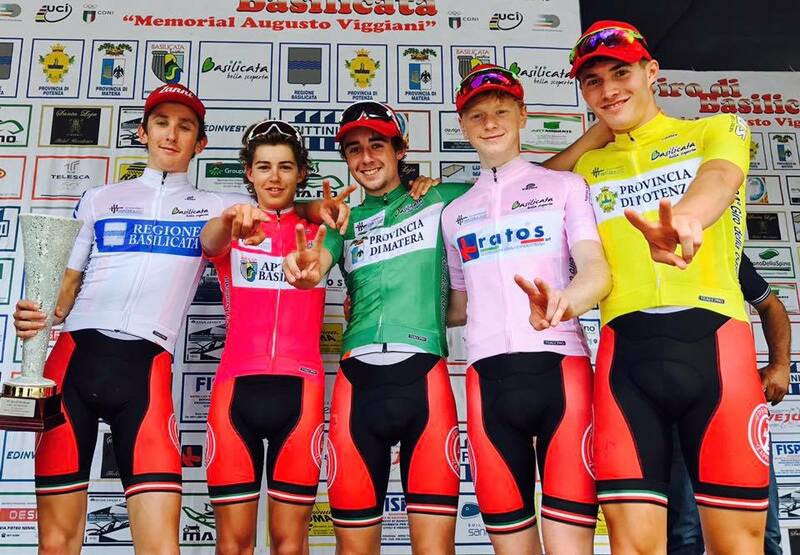 Lewis won the youth league which encompasses riders aged 13 – 16.